On June 6, 1944, General Dietrich Kraiss and the 7000 some soldiers of his 352nd Infantry Division were at Omaha Beach to meet the Allied invasion. Fighting valiantly against the overwhelming tide of American and British forces, Kraiss and 352nd were stretched thin at the beaches and continued the defense inland for weeks as they fought the Allied advance toward their objective of St. Lo. St. Lo was an important crossroads objective which had endured German occupation since 1940. On the morning of June 6, 1944, the city was hit with vicious American artillery bombardments. As the Allies advanced inland after the coastal landings toward St. 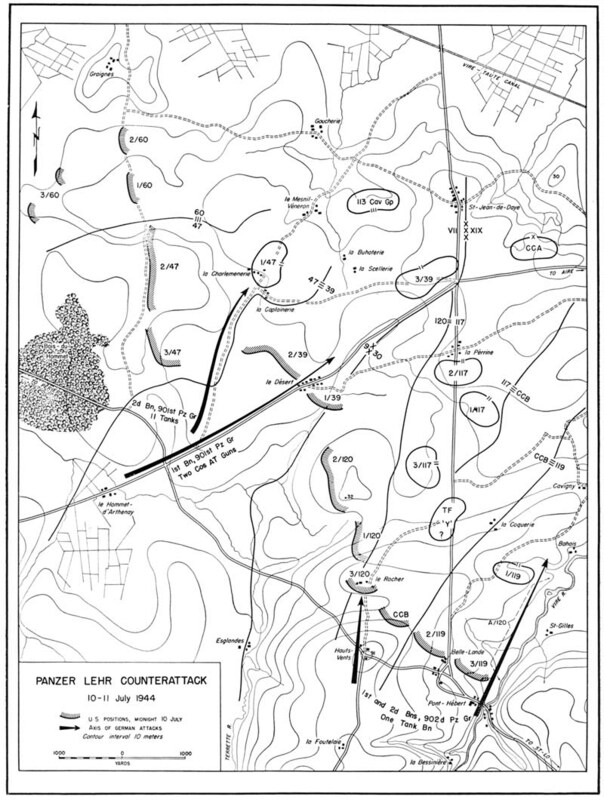 Lo, the German 352nd and 353rd Infantry Divisions and 3rd Parachute Division formed a line to slow them down. By late July, St. Lo was liberated by the Allies and the 352nd was destroyed. By early August, Kraiss was dead, and the German presence in Northern France was near its end. The Heroes of Omaha and Panzer Lehr book from Skirmish Campaigns outlines the eleven engagements during this key period from D-Day to the German counterattack through the Allied breakthrough. 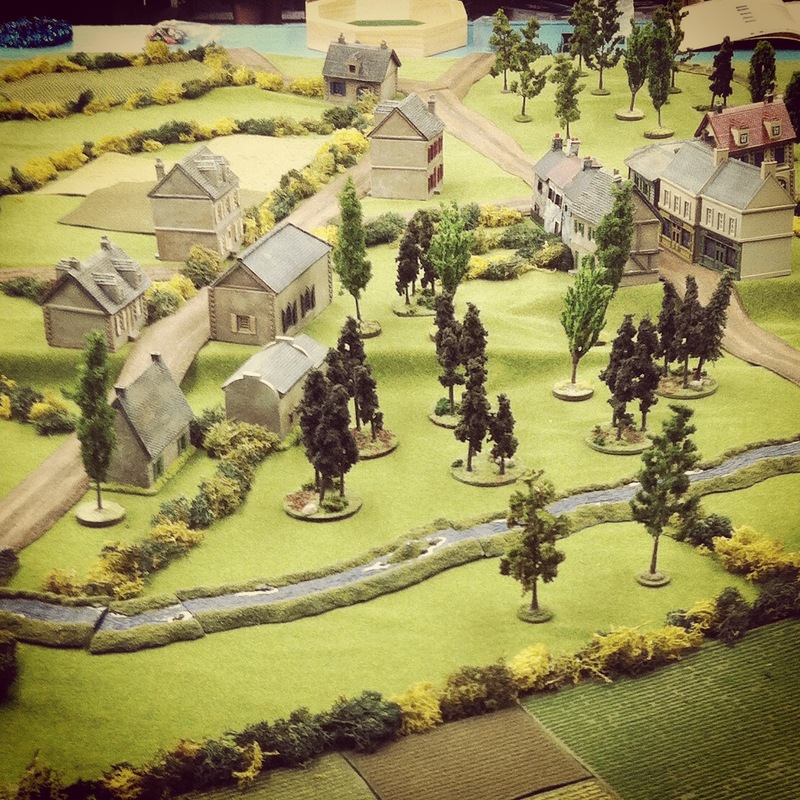 This past weekend at Metropolitan Wargamers in Brooklyn, NY we ran through the battle near Le Mesnil-Rouxelin just north of St. Lo on June 17, 1944. With elements of the US 175th Infantry Regiment closing in, General Kraiss and his headquarters quickly assembled an ad hoc force to delay the American advance. 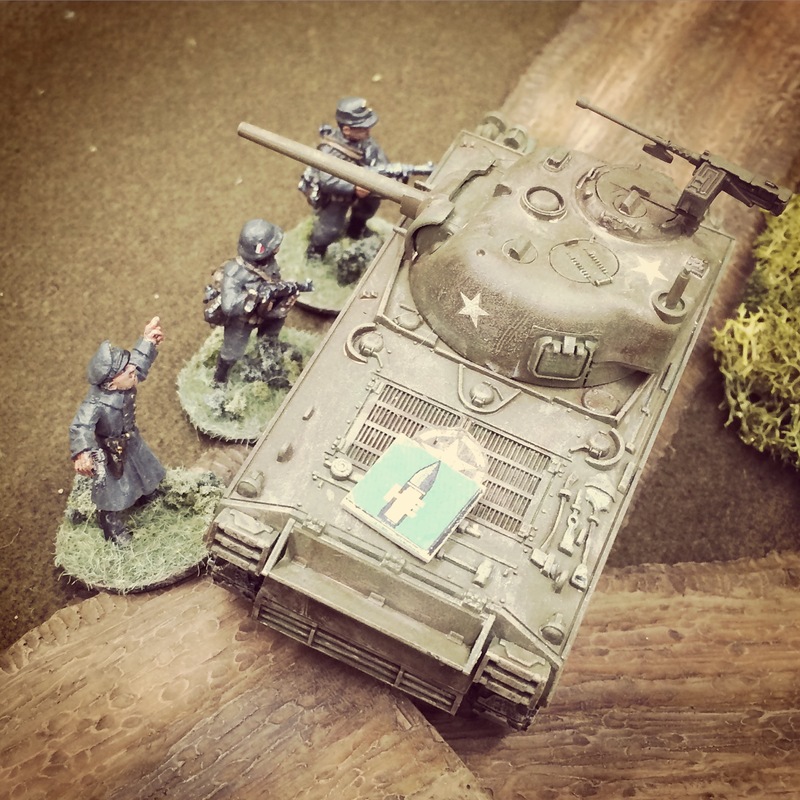 In the game, three US rifle squads (each armed with a BAR team) and a lone M4 Sherman must advance and seize the German HQ while being held at bay by several small German teams armed with rifles, Panzerfausts, a mortar and a MG-42. 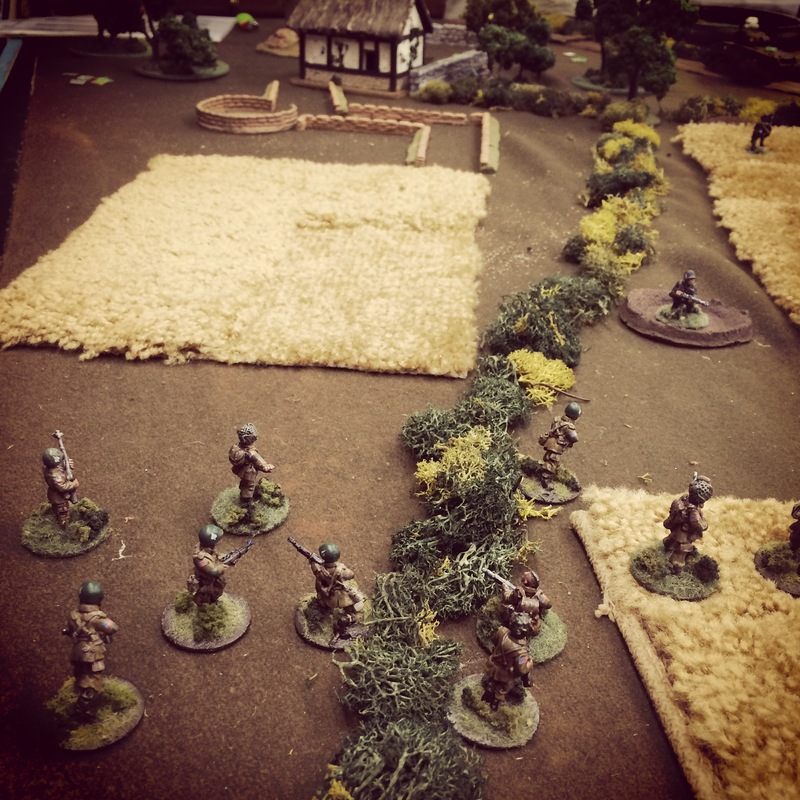 the Americans have to hustle, and they have eight turns to capture the German HQ before Kraiss and his staff can make their escape to fight another day. 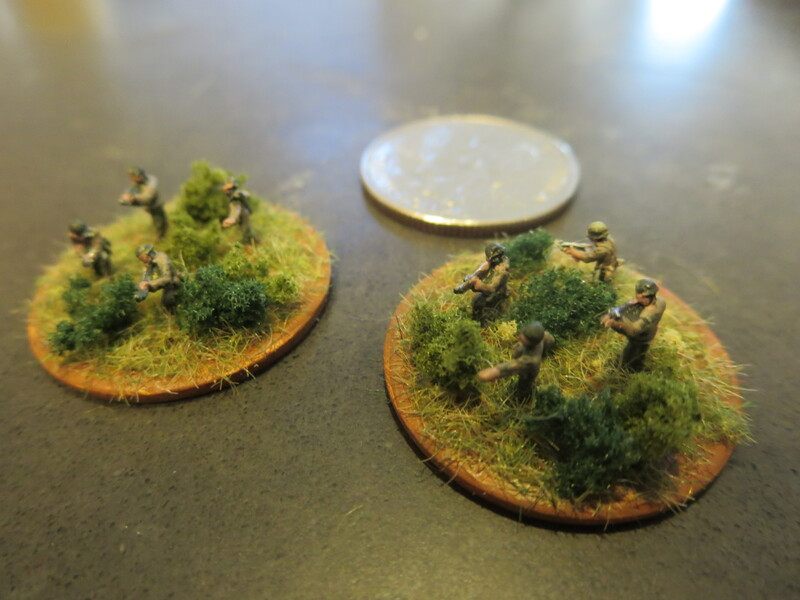 With my US Airborne 28mm models standing in for the American infantry, they spent the first few turns moving in from the north and navigating the bocage hedgerows. 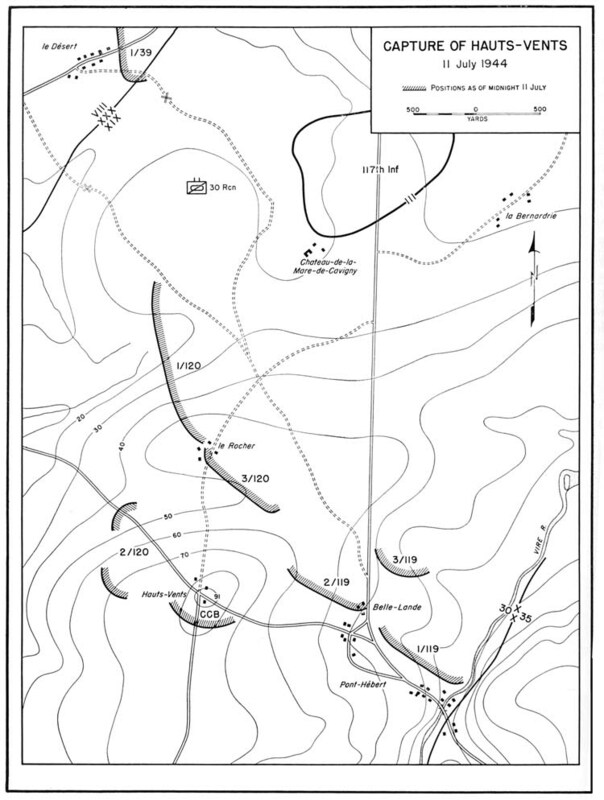 Two squads and the US HQ moved to the east of the main road, the Sherman ran straight through the middle and one squad edged toward a French farmhouse mid-field. The German machine gun set up at the road edge in the bocage, looking to cover the advance by road or in the thick fields. 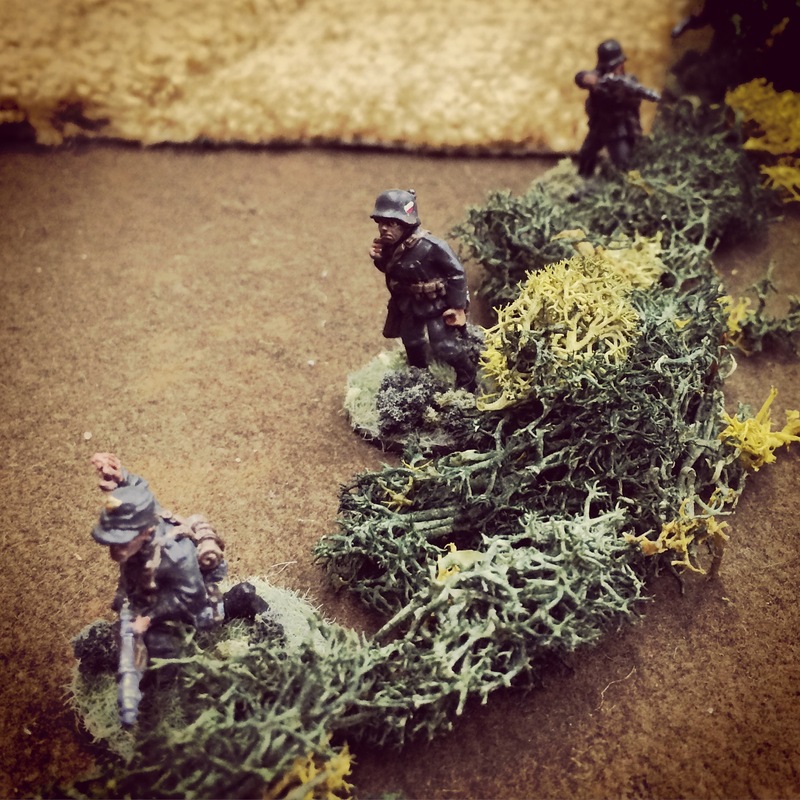 Other German riflemen spread out along the hedges, looking to create a defense using their thin units and cover to the best advantage. By turn four, the firing began. Germans along the bocage made an attempt to shoot the Sherman at close range with a panzerfaust but the shot miraculously missed. 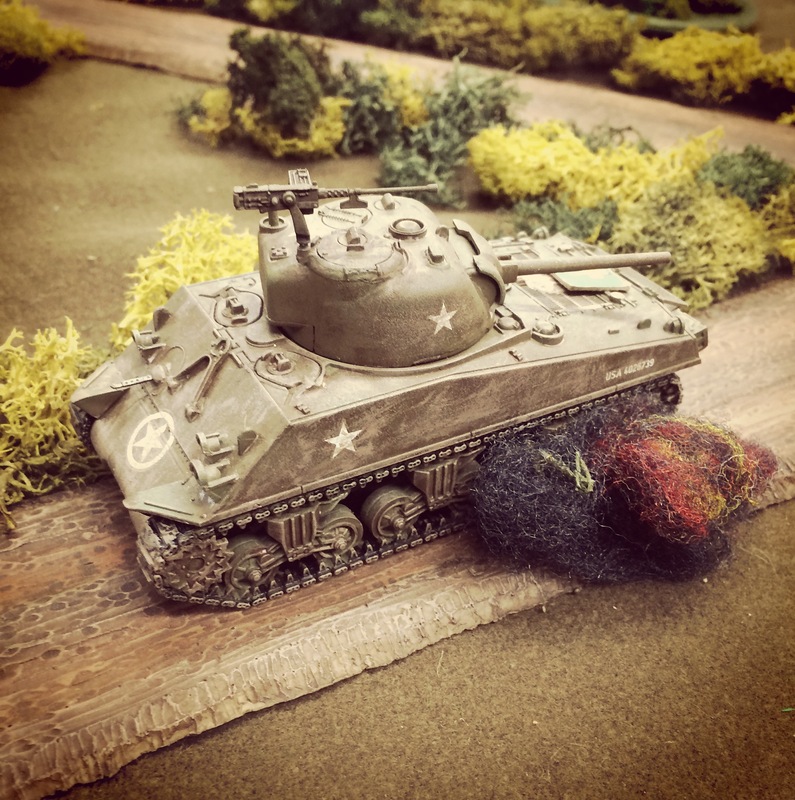 The Sherman answered with a burst of machine gun and high explosive shots, forcing the Germans to fall back from the hedge and into the field. The Sherman rolled forward and a second squad of Germans emerged from the bocage and rushed the tank, placing three grenades along its left side. With the charges set to blow, the tank moved forward and rotated its turret to light up the exposed Germans with another round of machine gun fire, destroying the entire unit. 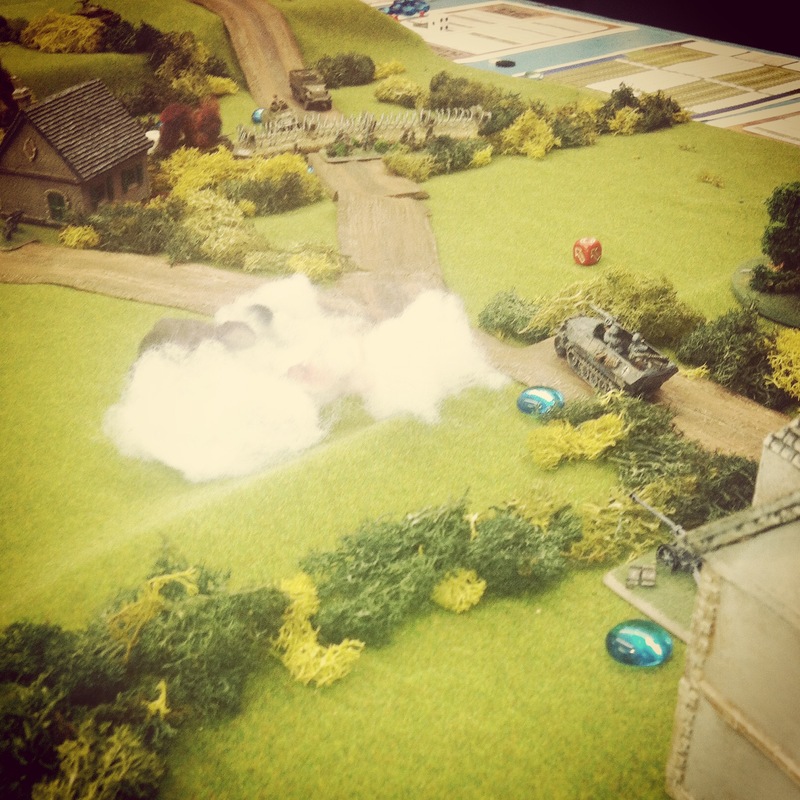 Just as the smoke cleared, the grenades blew up along the side of the tank, immobilizing it for the game with its weapons still functional and crew left unharmed. Back in the field at the center, the German rifles and MG-42 took up new positions and the two US rifle squads and HQ continued to creep forward in prone positions. 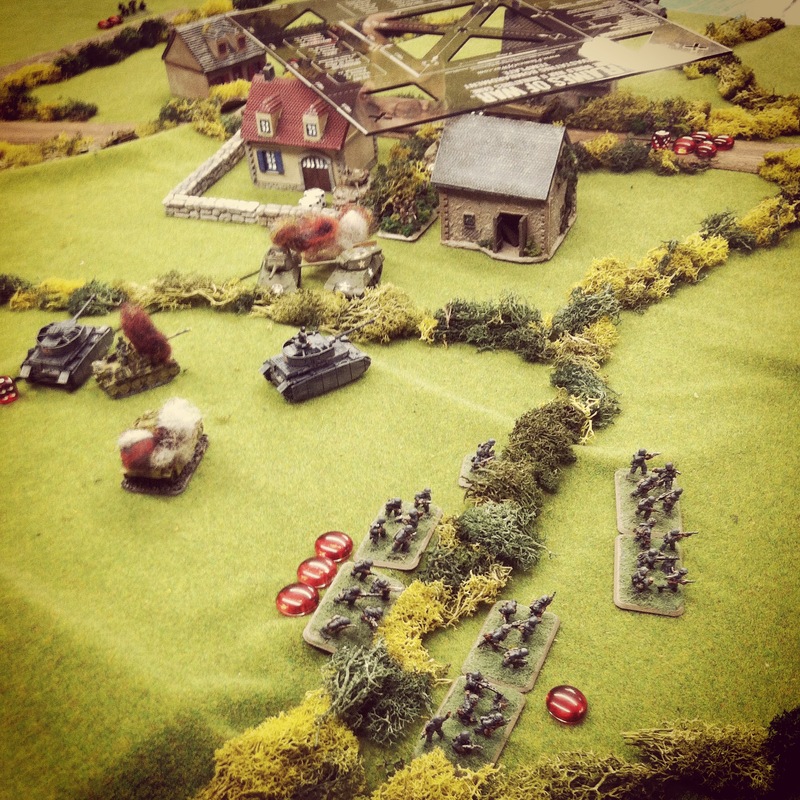 With game time running short, the Americans in the field stood to fire on the Germans. Two German riflemen fell and the MG-42 crew took heavy fire, knocking it out for a round as the remaining crew scrambled back into position. 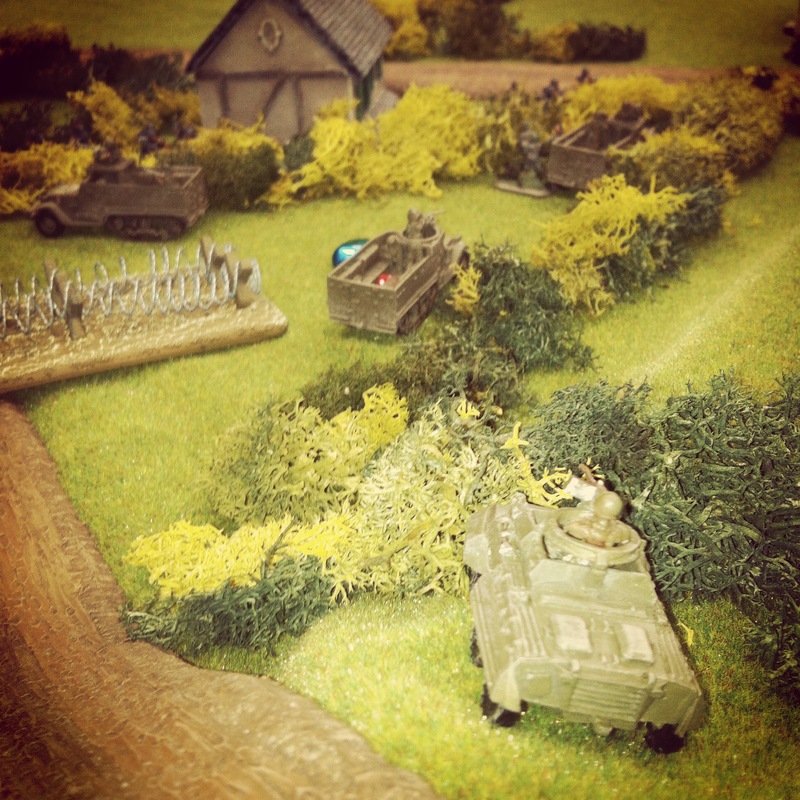 At the left of the field, a US squad opened up at the Germans stretched along the hedgerow. Leaping the bocage and rushing forward, the Germans vanished in a hail of bullets, opening the route forward to the German HQ ahead. 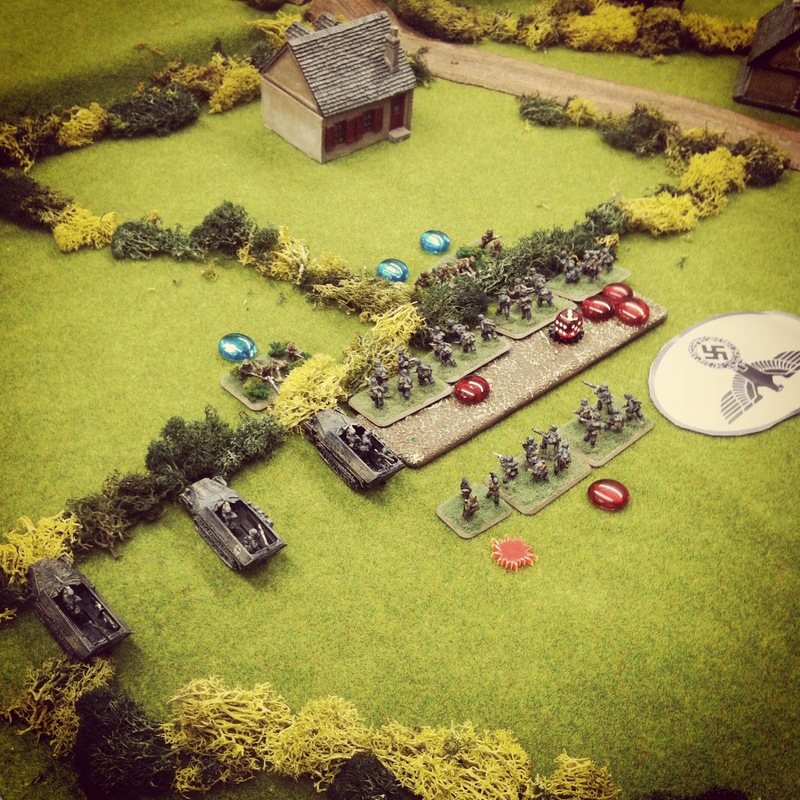 At the same time, Germans fell back along the right side of the field and the Americans ran forward. 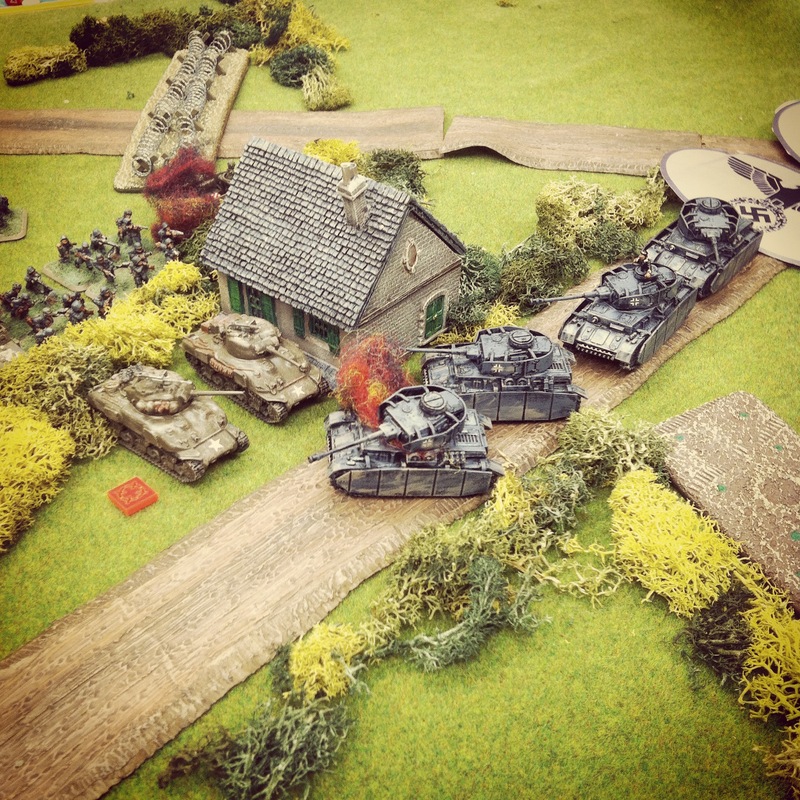 On the far US right, the third fire team ran forward, using their broken tank as cover as they made an end run toward the German command team in their farmhouse HQ. 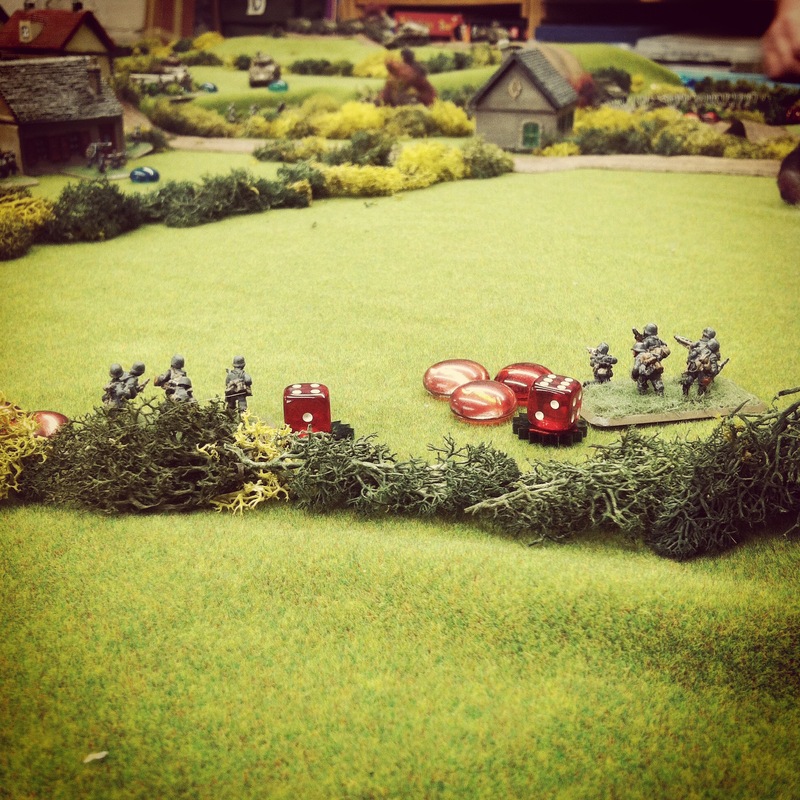 By the sixth turn, Kraiss and his command staff were on the move, making a run south from the safety of the farm where they had sat in cover for the whole game. 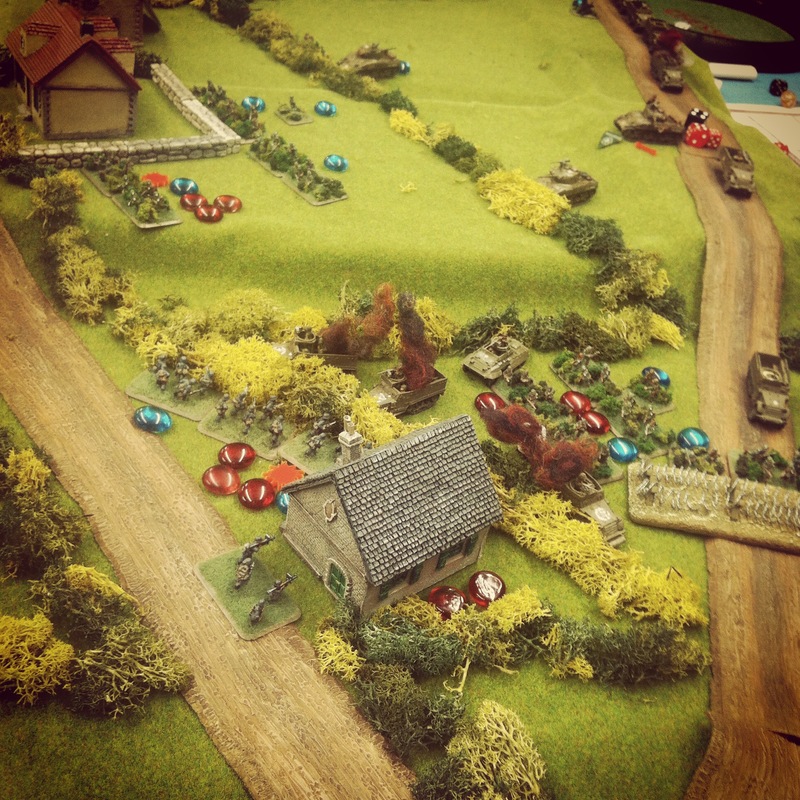 With the final German defense in the field breaking, Americans broke through toward the farmhouse straight ahead and to both sides. Four remaining German rifles behind a wall and in a small copse of trees at the farm exchanged fire with the Americans, holding off dozens of GIs as Kraiss continued his run for safety. 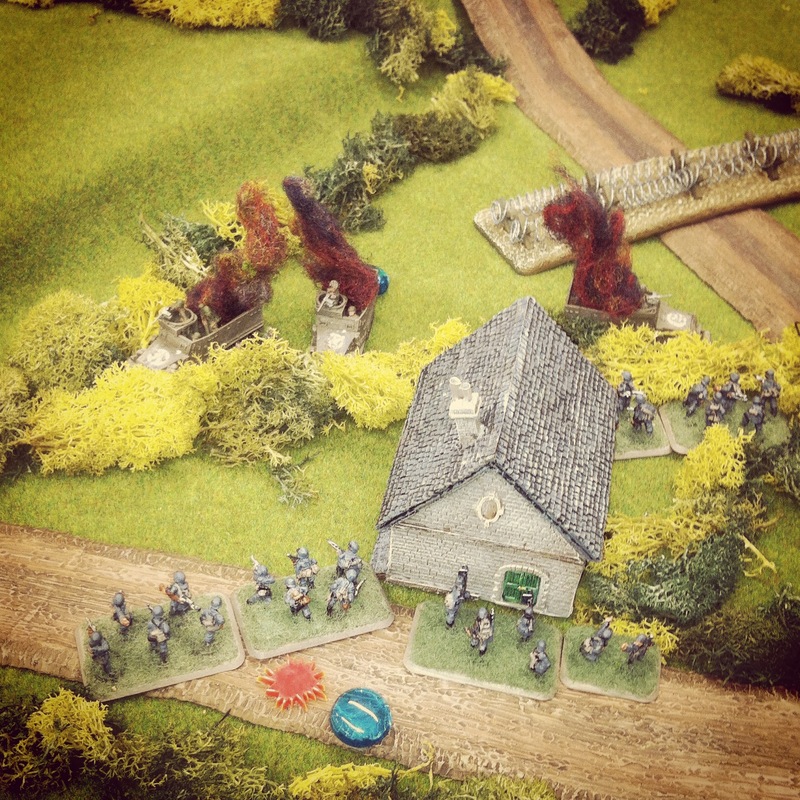 With the final turn eighth turn’s arrival, the Americans finally reached the edge of the farm. After quick series of shots, another German fell but no Americans were able to seize the HQ in time as Kraiss and a couple straggling men slipped off to the south further toward St. Lo..
Our battle at the German HQ near Le Mesnil-Rouxelin presented a pretty good feel for the fighting that occurred in mid-June 1944. 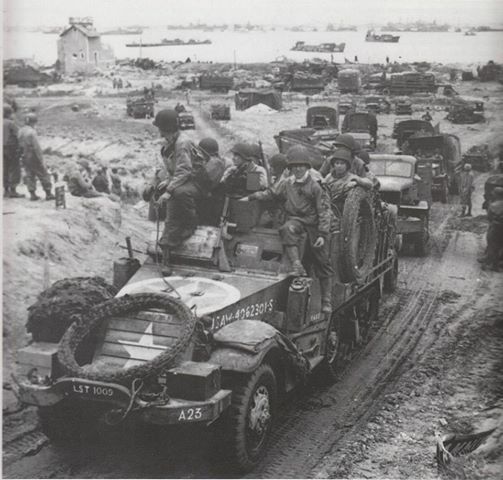 With a wave of Allied forces closing in toward their objective of St. Lo, General Kraiss and the other German commanders struggled to stall the advance. With the four-year German control of Northern France at stake, German forces cobbled together a fierce retreating defense. Beginning with the tide of men landing on the beaches and from the air on D-Day, the war had turned inevitably for the Allies. 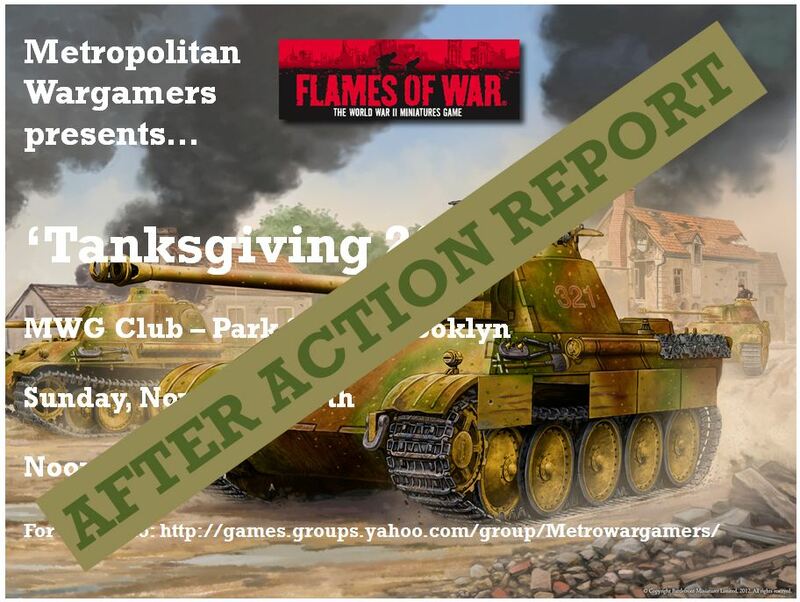 This past weekend seven of us gathered at Metropolitan Wargamers in Brooklyn, NY for our second annual Flames of War Tanksgiving event. 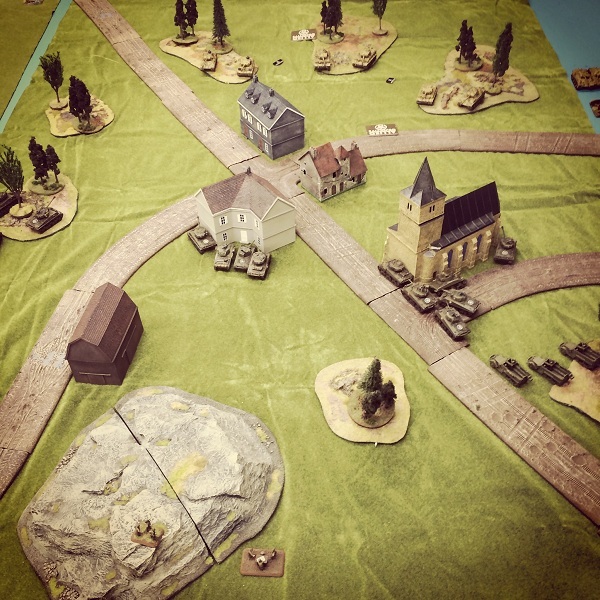 One new player and six experienced FOW gamers (including two father/son pairs) played through five Late War games using 1750-point companies stretching over three tables — two from Western Europe and one from the Eastern Front. Over the course of the afternoon, British, US, German, Soviet and Hungarian forces fought it out with a mixed results but a slight edge toward the Axis for the day. 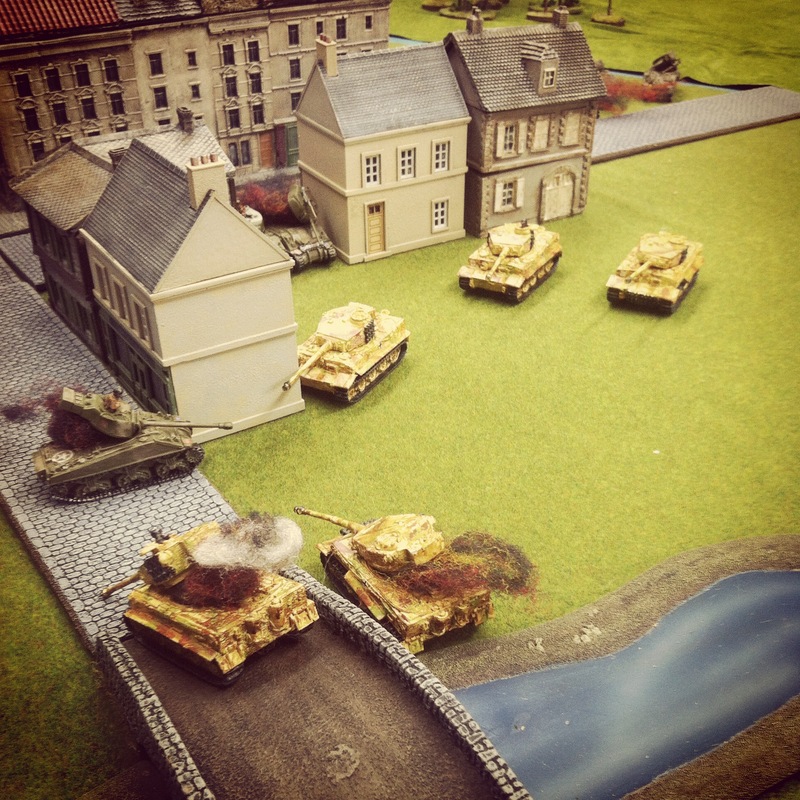 The first Western Europe table presented a No Retreat Mission with the Guards Armoured defending a small town from a raiding Tiger-led German force attacking from the open farm area across a river. The Guards deployed an eight 25-pound gun Royal Artillery at the back edge of the table and one objective near the bridge spanning the river to the town. With three other platoons of Sherman and Sherman Firefly tanks in reserve, the initial British force would need to hold fast against the German onslaught. 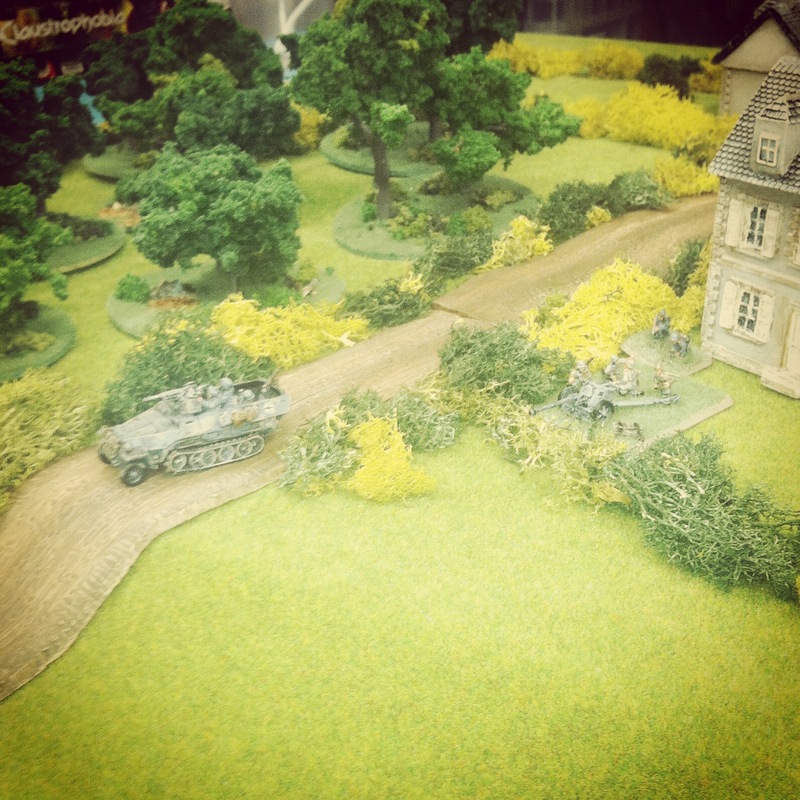 The Germans began the game fully deployed and slowly moving their Tigers toward the bridge and an objective just beyond. With famed tank ace Michael Wittman commanding, the key for the spare British force was to stay away from the deadly guns of the German tanks. At the river ford in the center, the Panzer IVs moved to flank the other side of town with Panzer Grenadiers mounted in half tracks at the rear. 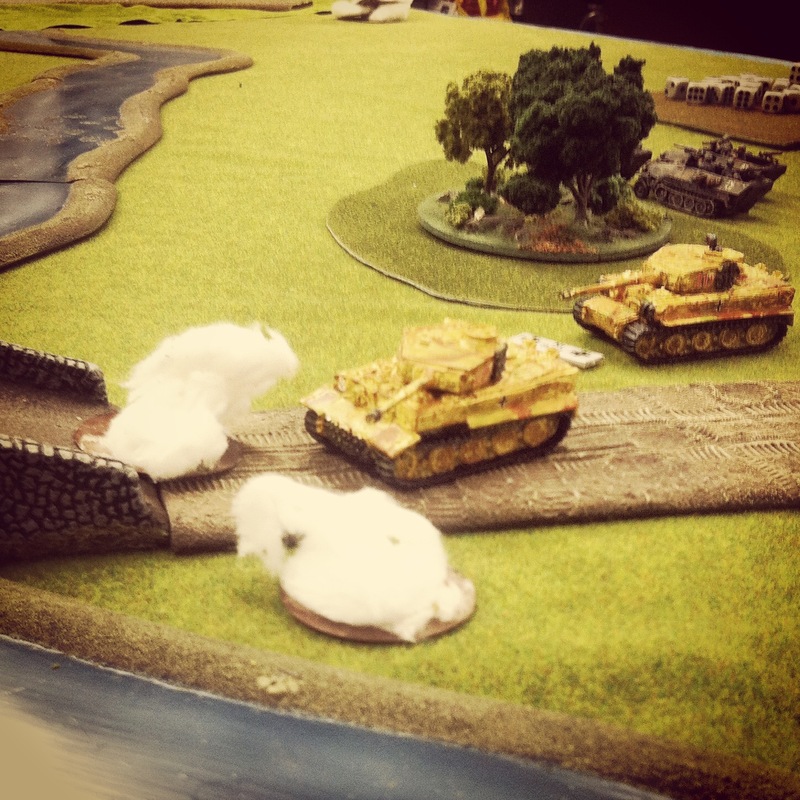 The best the British could do was fire smoke rounds into the Tigers across the river and follow-up with long-range shots from the single Firefly deployed at the beginning of the game. Over the next two turns, British reserves arrived and made way for the center of the town, using the tight cobblestone streets and buildings as cover. Artillery spotters stationed in the rooftops of buildings called in several turns of artillery fire but failed to have any effect on the Tigers and destroying only one German halftrack at the river. A crack shot from a Firefly at the center of the town destroyed the first Tiger over the bridge. 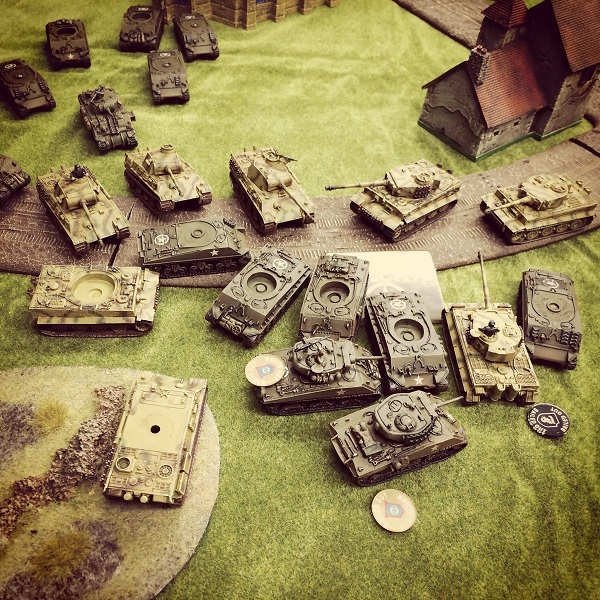 By the end of the fourth turn, the Panzer IVs wheeled to get into the town at the British left but were pushed back by fire from British Shermans. In the fifth turn, the two remaining platoons from the Guards Armoured arrived to the British left and pushed forward toward the Panzer IVs. With two German tanks quickly lit up, the surviving Panzer IV fell back to the treeline where it was destroyed in the next turn. 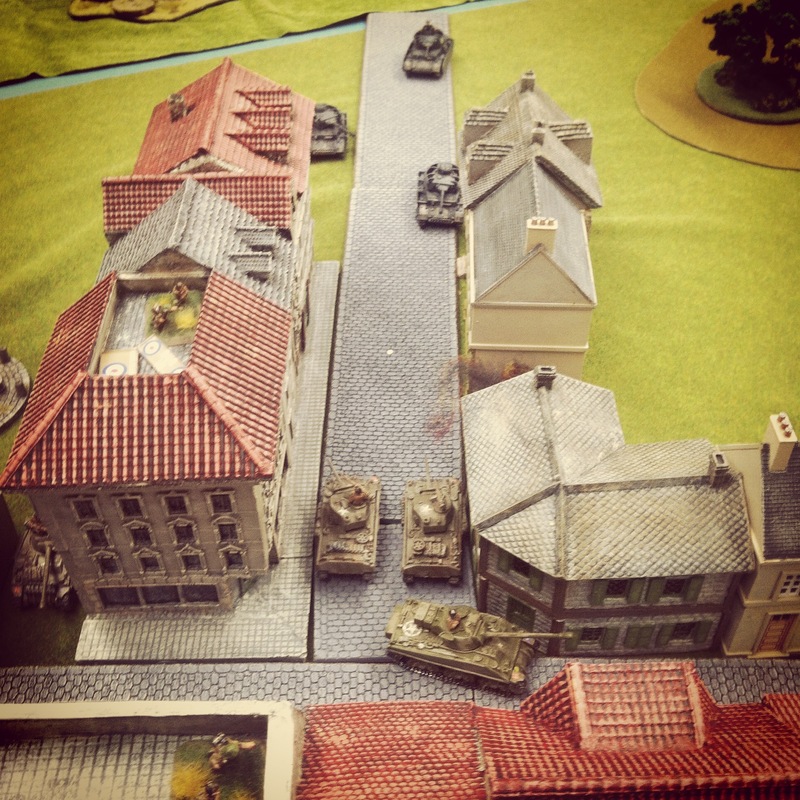 The British held their left for the moment, but in the cover of the raging tank fight, the dismounted Panzer Grenadiers had managed to slip into the town’s buildings unharmed. As smoke continued to hold the Tigers from firing at the bridge, a second Tiger was destroyed from a volley from the same Firefly that had sent the first Tiger into flames. While action at the bridge stalled, the three other Tigers had been working their way through wrecking the British tanks which had destroyed the Panzer IVs. All the while, the German infantry had continued to work through the town’s building’s untouched and toward the objective back the rear of town. The British command tanks rolled to stall the advance of the Panzer Grenadiers with machine gun fire and cover the objective. 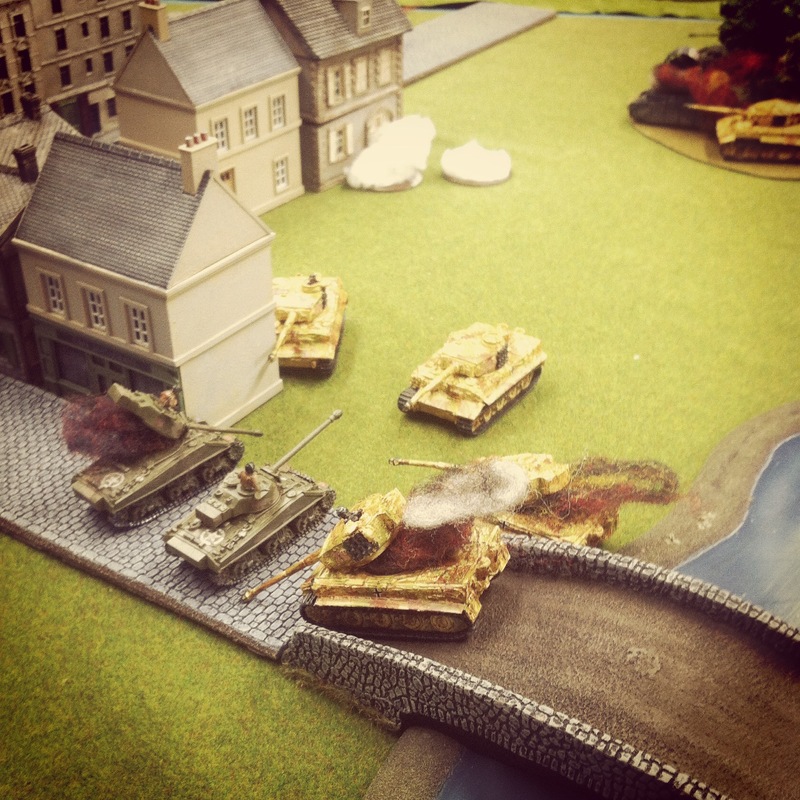 With most of the British armour ablaze throughout the town, three Tigers rolled toward the objective at the bridge. The surviving British tanks had continued to make successful morale checks with the benefit of their special rerolls. The two surviving Firefly Shermans took a combined shot at a Tiger’s rear and missed. The Tiger’s spun around to return fire, destroying a Firefly. 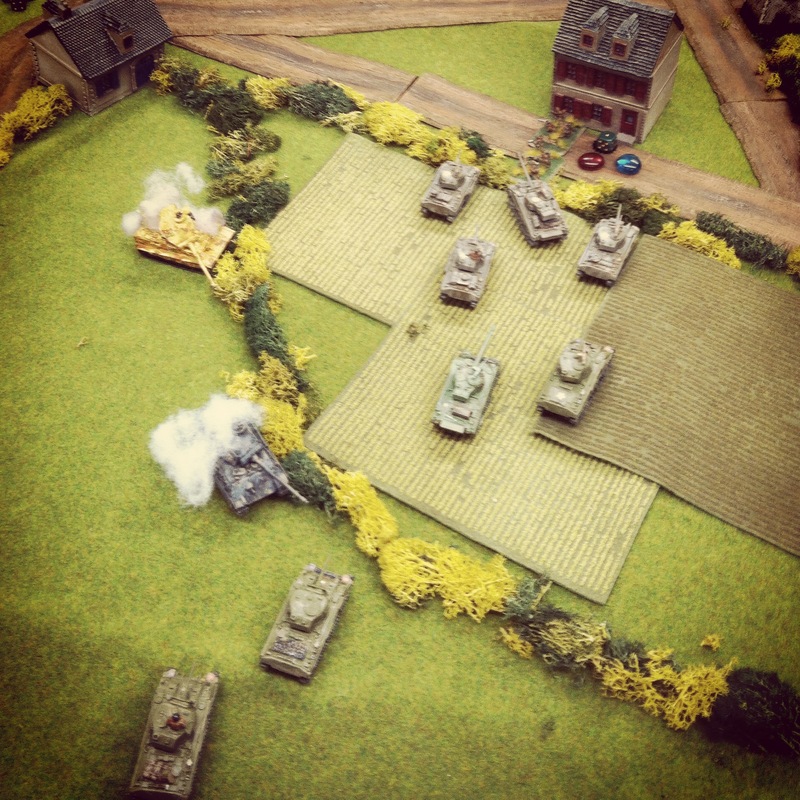 With further ineffective artillery rounds and just one Firefly sitting between three Tigers and the objective, the game was called with a victory for the Germans. Final Result: Victory for the Germans! 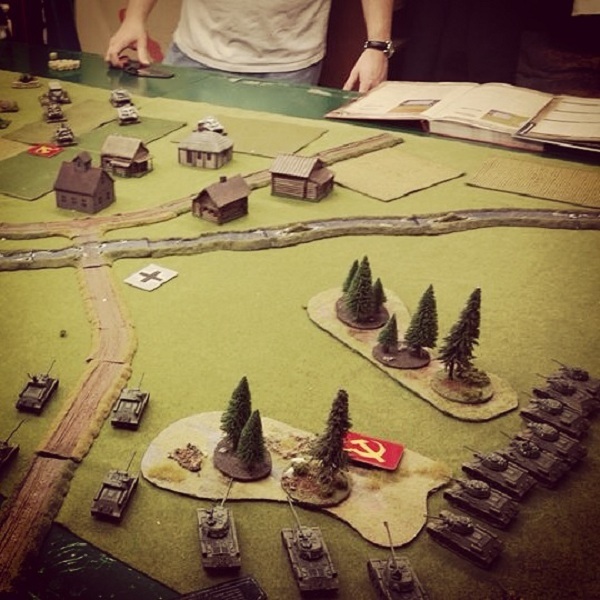 The day also saw a couple Eastern Front games with Hungarian and Soviet forces facing off on tables set up using a random terrain generator. The Eastern Front table showcased log structures from the excellent Miniature Building Authority Russian Village set along with some rural farm buildings from FOW. 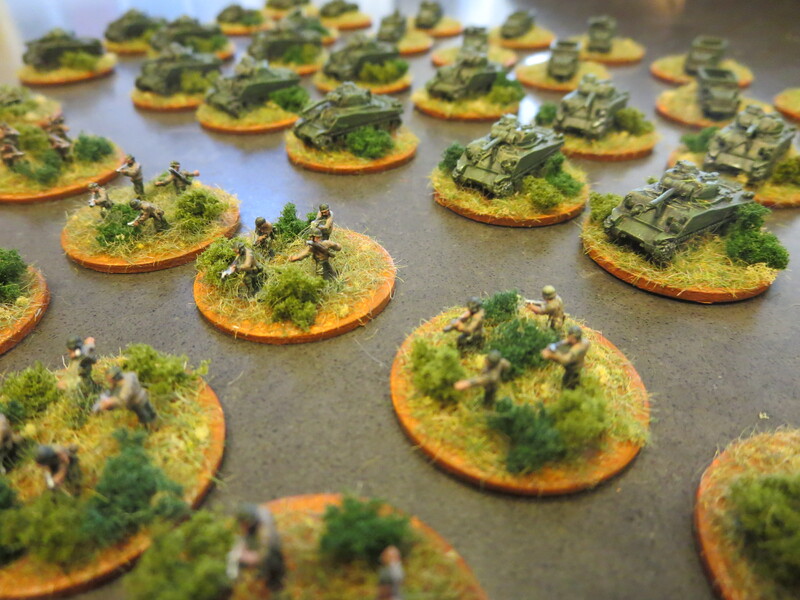 Each game saw the Soviets as the attacker, the first taking place on a table representing the bleak steppes of Russia in a Fighting Withdrawal Mission. The defending Hungarians began in prepared positions with a howitzer battery and Panzer IVs to their right, infantry at the center and tanks at the left. The Soviets with T-34 obr 1942 tanks at their extreme left and right, SU-100 tank killers and a Gvardeyskiy Tyazheliy Tankovy company at the center and a heavy mortar company at the rear. 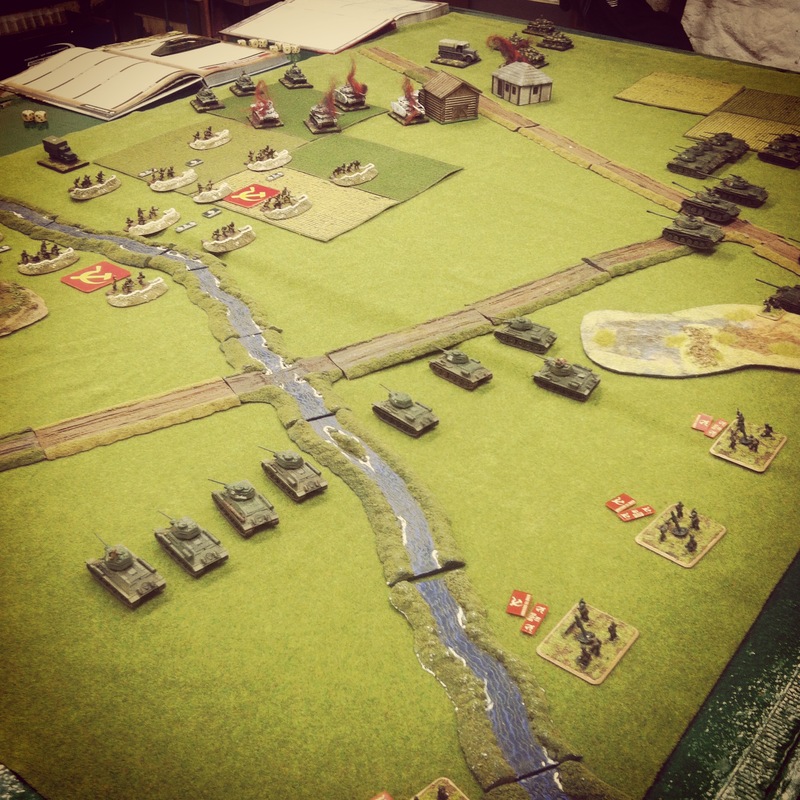 The second Eastern Europe match-up occurred around a collective farm complex with a Dust Up Mission. Starting from opposite corners, both the Hungarians and Soviets positioned themselves into a fantastic series of turns in and around the small farm. 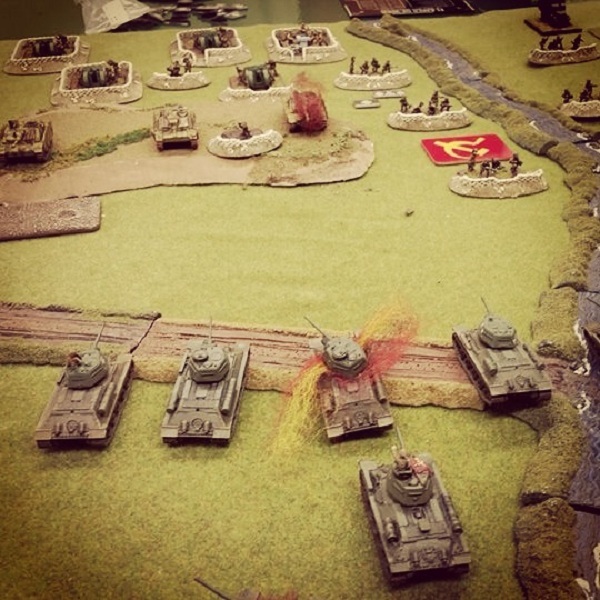 With both players moving, dodging for cover and firing at close range, the Hungarians and Soviets sparred for victory as tanks burned all around. As Hungarian reserves arrived late in the game, infantry climbed out of their trucks and assaulted the Soviet T-34s. Soviet reserves likewise entered the game and made way for the Hungarian howitzers and the objective at the opposite corner. With two intense assaults at either end of the field, the Soviets gained a slight edge and were able to score their second victory on the day. Final Results: Two Victories for the Soviets! 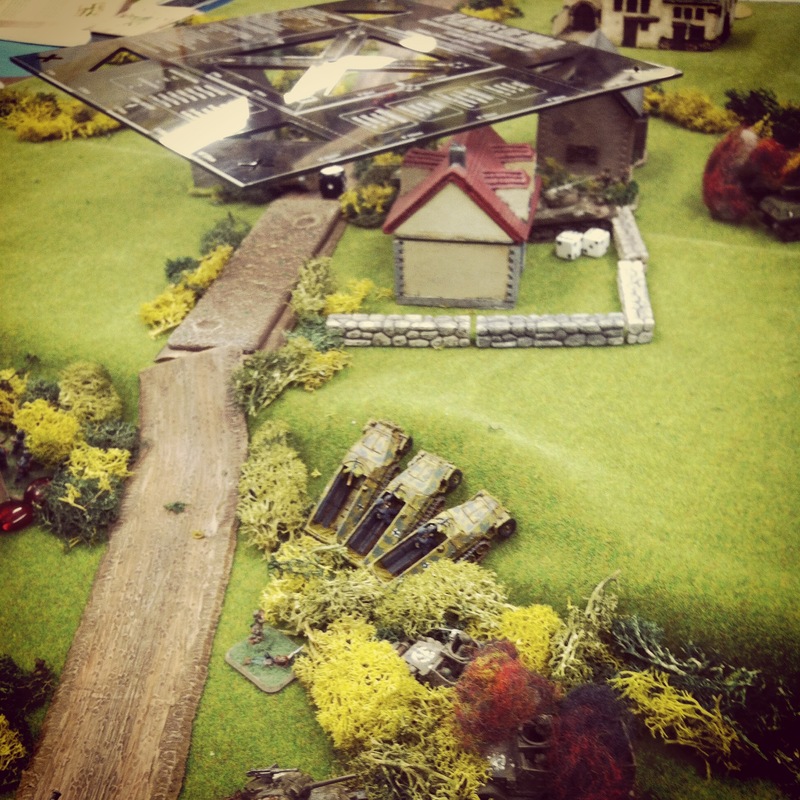 Back on the other Western Front table a spare rural village anchored by a prominent church and surrounding hill and forests, a deadly force of German Panthers, Tiger Is and Königstigers squared off against the US 7th Division. 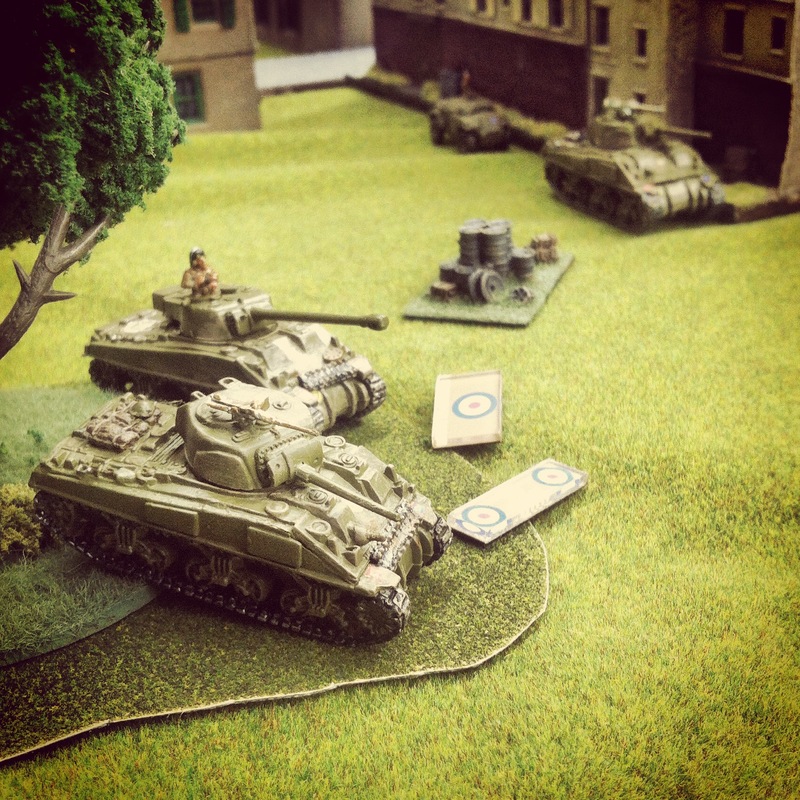 The Americans rolled into the first Pincer Mission with standard Shermans, M4A3E8 Easy Eights and M4A3E2 Jumbo. At the rear, M7 Priests and 81mm mortars mounted in half tracks were positioned to cover the field in smoke while a P-47 Thunderbolt was on call to swoop in against the German force. 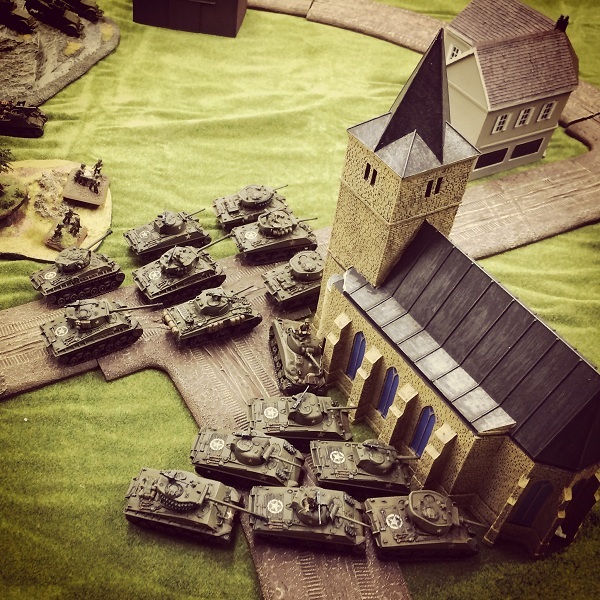 Hoping to avoid German fire, the US tanks crowded into position using the church and other structures for cover as they eased across the field. Once engaged, the Jumbos did their job of eating up fire from the German guns and allowed the other US tanks to advance toward the objectives. Even with smoke cover fired from the rear, air support above and a mass of US armor, the cautious pace of the Americans was no match against the German Tigers firing from the woods. 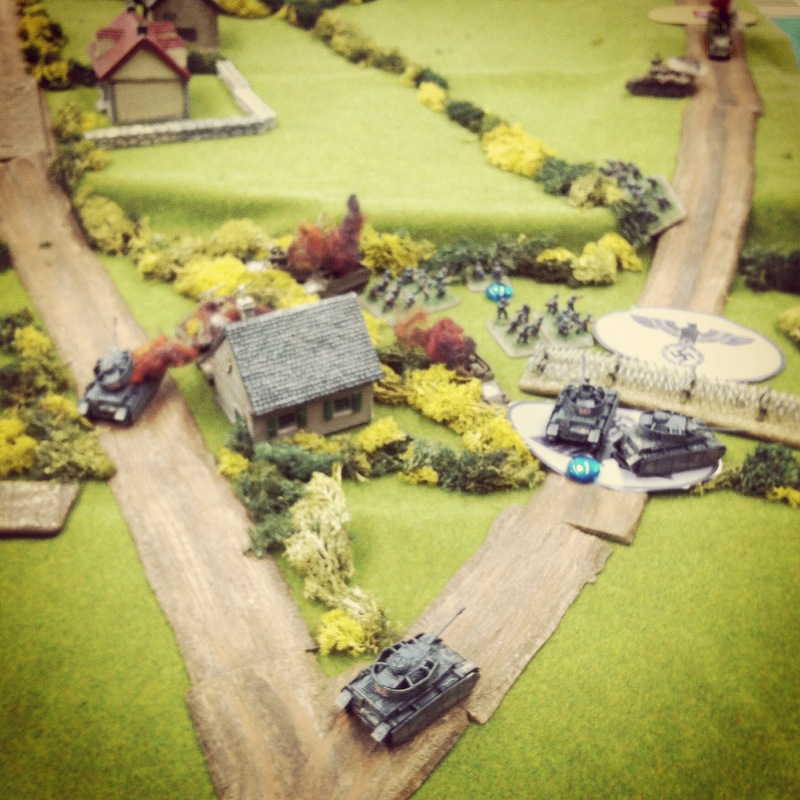 By the time the Americans made a push for the objective in the open, the German tanks were squarely deployed to defend the objective and take the game. 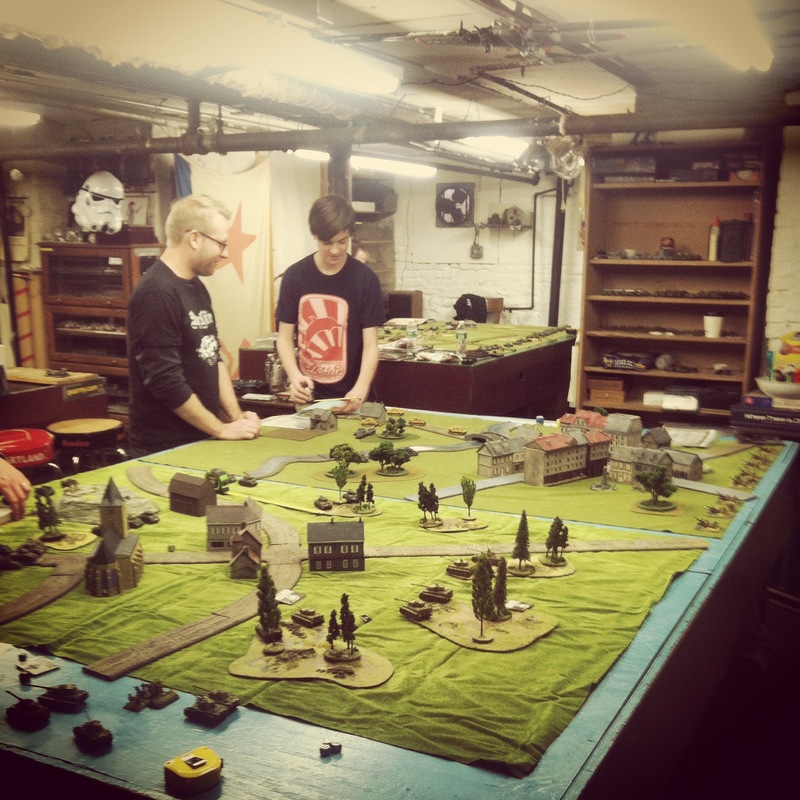 The players switched sides in the second No Retreat Mission on the same table. Again, the Americans came on the table on the far side of the town but this time chose to race aggressively toward their objectives. Defending from the wooded areas again, the Germans were able to fire at will on the advancing Americans. Quickly moving to a close series of short-range duels, tanks on both sides shifted to get into important side armor shot positions. With a tight cluster of models crowding the field near the objectives, American artillery smoke and air support quickly became irrelevant and some lively debate erupted around lines of sight and facings. The second game was a much closer match, but in the end, the thick hulls of the German tanks were no match for the American guns. Final Results: Two victories for the Germans! 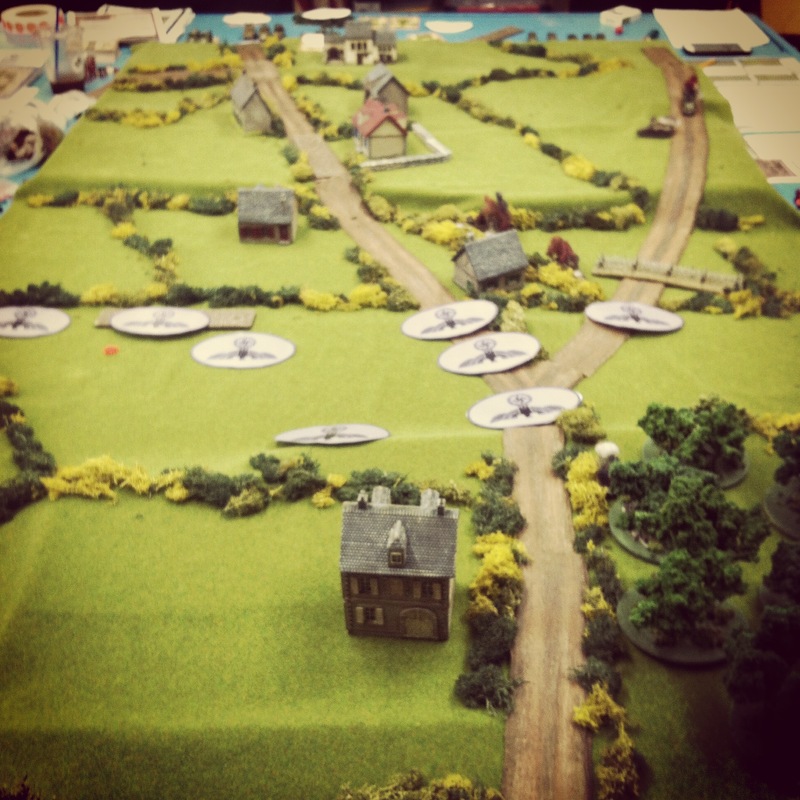 At day’s end, the Axis came out with a slight edge of a 3-2 victory over the Allies across two European fronts. The presence of tough late war German Tiger tanks are a hard force to crack, even with quality American and British armor with lots of air and artillery support. On the other hand, the Russian tank horde always proves to be a formidable Allied opponent whether facing Hungarians or Germans. 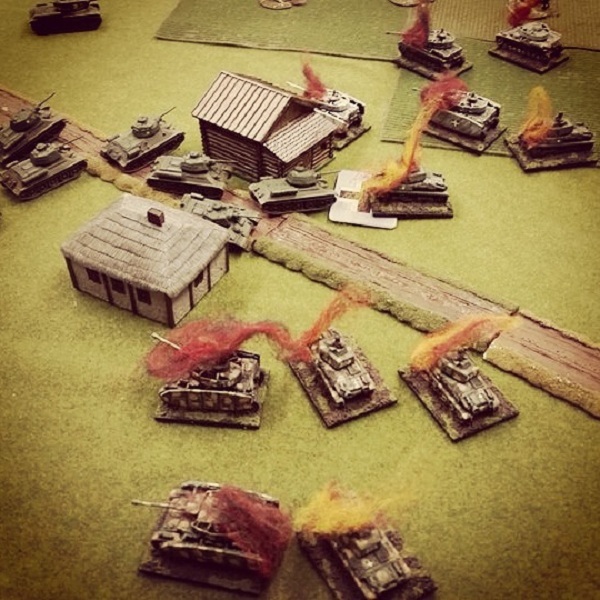 Force quality, tactics and a bit of luck always play a role, and our five Tanksgiving games were all unique examples of how Flames of War tank battles can go on any given day. The battle near Hauts-Vents was a two-day affair between the US infantry and armored forces and German Panzer Lehr Division. After a day of intense combat on July 10, 1944, US forces were warned of local movements of the 902 Panzer Grenadier Regiment toward Hauts-Vents. With a German counterattack expected in the early morning hours of the next day, American infantry and armor prepared for a defensive fight under the cover of darkness and foggy, damp weather among the dense bocage hedgerows and under cover of the strong French buildings. 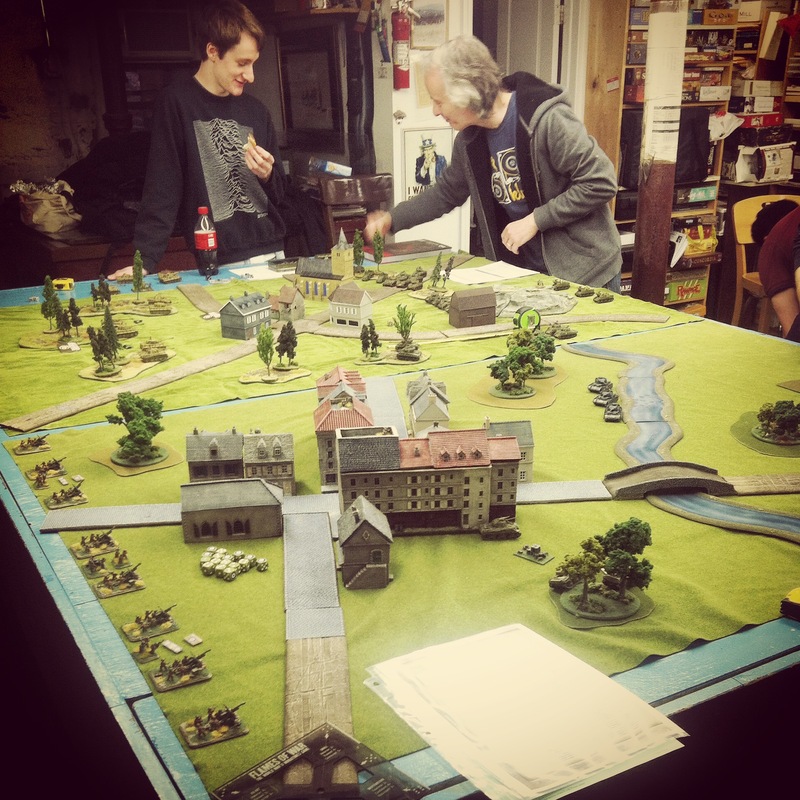 After a first game loss at Hauts-Vents by the Germans, we continued our campaign at Metropolitan Wargamers in Brooklyn, NY this past week. 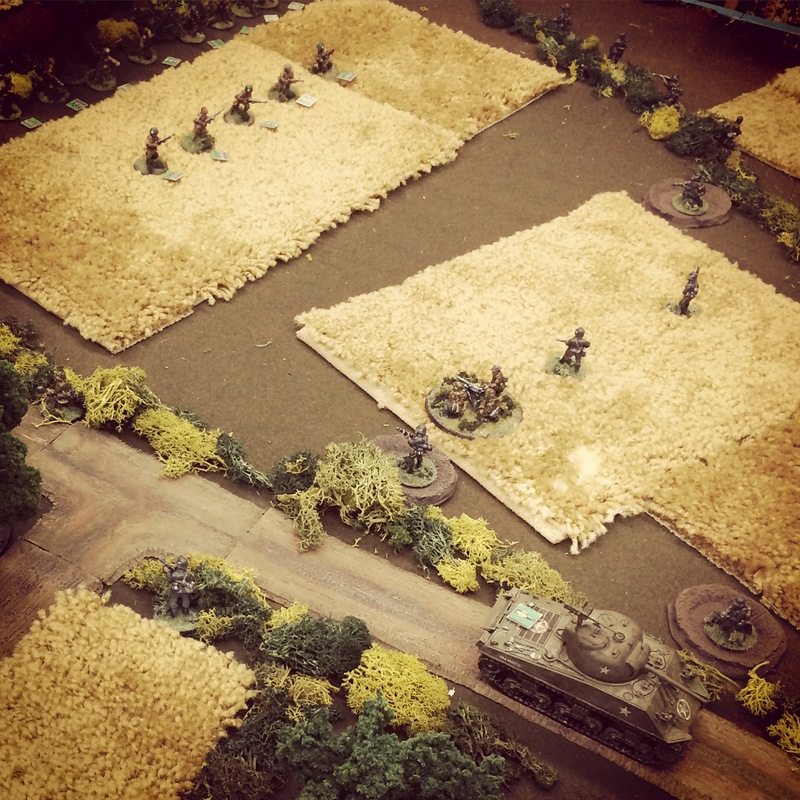 The second game from the “Panzer Lehr Counterattack” mini campaign from the Heroes of Omaha and Panzer Lehr scenario book from Skirmish Campaigns is called ‘Morning of the 902nd.’ The game uses the same terrain set-up as the first scenario, but this time focuses on the German attempt to recapture Hauts-Vents on July 11 after losing key objectives to the Americans the day before. 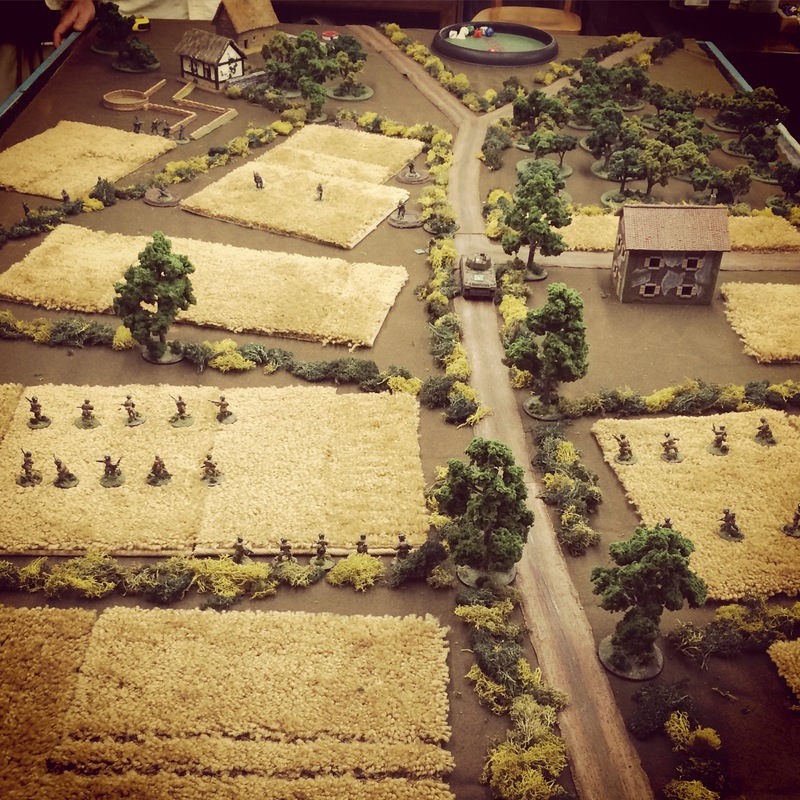 The game begins under pre-dawn darkness over wet ground with US platoons in hidden positions at the north end of the table and the Germans advancing under blinds from the hill position to the south. The Germans must retake the field by capturing two of the three objective buildings at the center town. The German advanced on blinds from Hill 91, making a hasty frontal push straight for the town. On the German left, mechanized Grenadiers mounted in Sd. Kfz 251s roared their engines and drove straight into a minefield at the bocage at the bottom of the valley outside town. 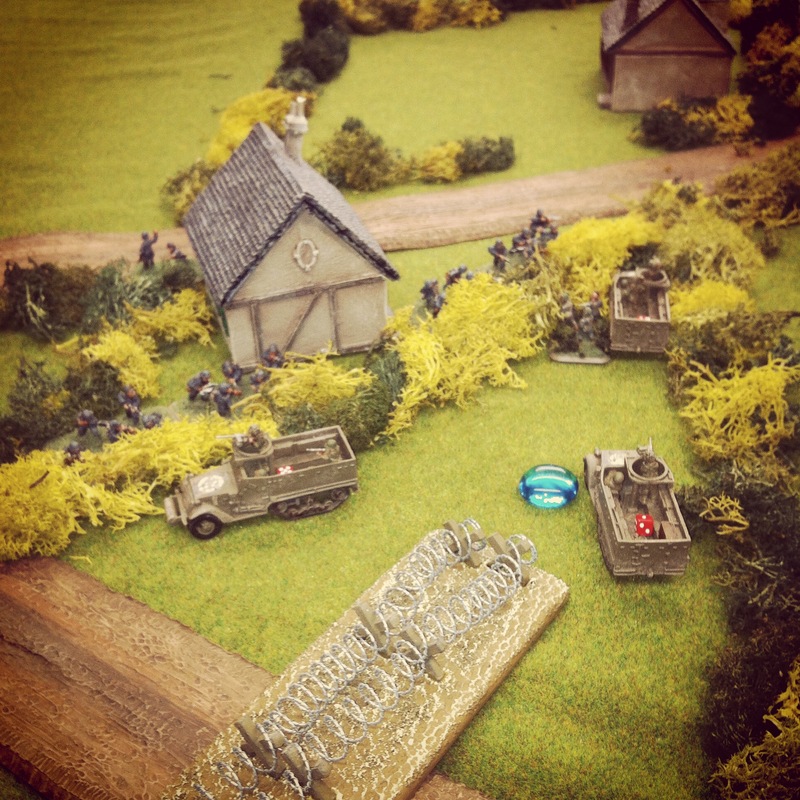 Making matters worse, American machine guns hiding in the dense hedge sprayed the German line with fire. German infantry and half tracks fired back, destroying one US machine gun team and forcing a retreat of the other to the center of town. At the end of the firefight, the German commanding officer escaped but three fire teams in one platoon took heavy damage, forcing them to fall back. On the German right, things didn’t go much better. A column of Panzer IVs drove on the main road for town, accompanied by a a Grenadier platoon closing in on a farmhouse they had lost the previous day. 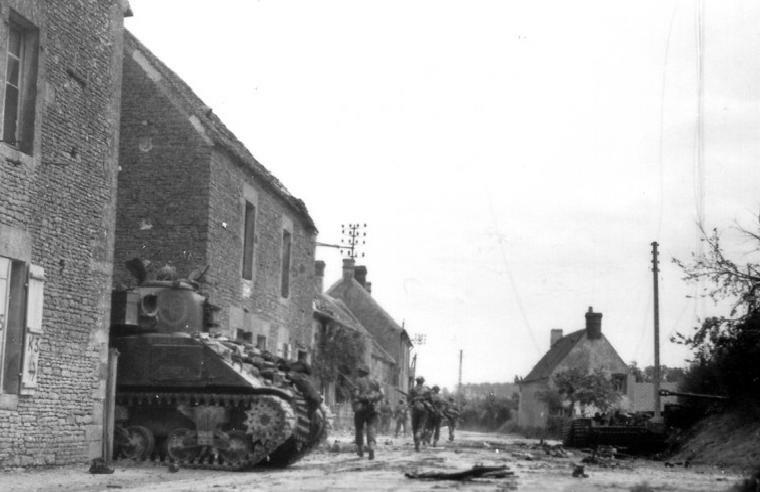 Waiting hidden at the stone cottage were two M4 Shermans which opened fire at the lead Panzer at close range , leaving it a burning hulk blocking the road forward. 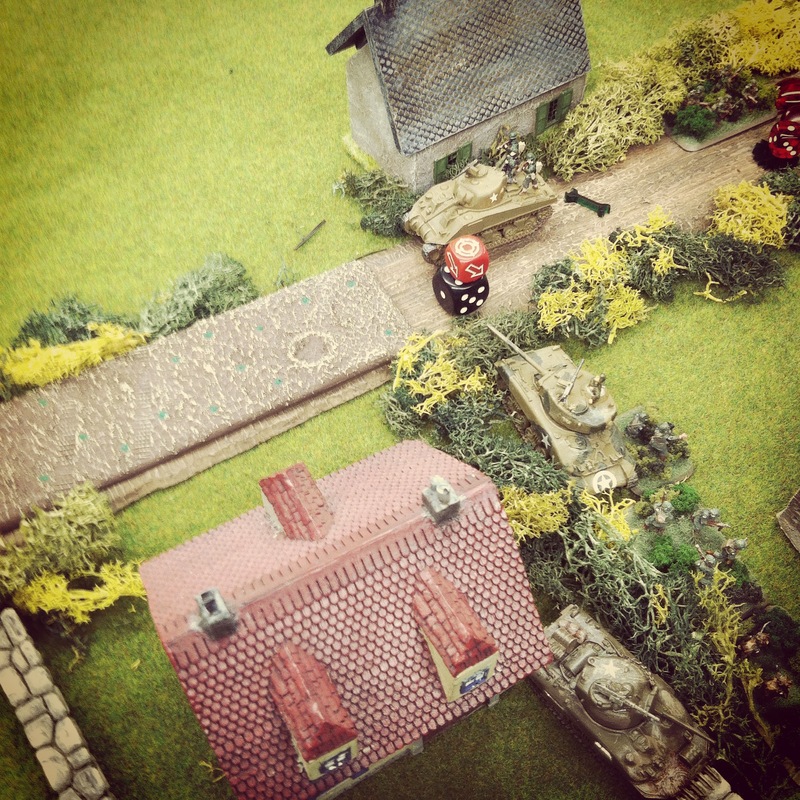 Closing in from behind, Grenadiers ran to engage the tanks with a Panzerfaust shot on their rear armor. Several turns of fire were exchanged between the Shermans and Panzer IV second in line as the two rear Panzers reversed direction back to the fork in the road. A few rounds later both Shermans were destroyed, and the surviving three Panzer IVs and the unharmed Grenadiers were heading for the east side of the town. 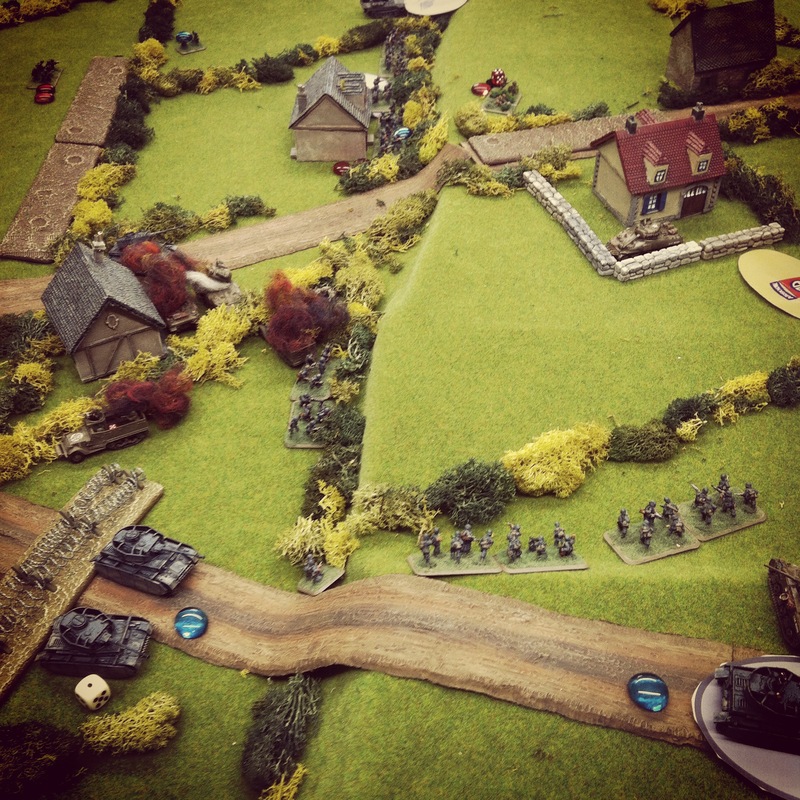 The Germans continued their advance up the road on the US left, looking to flank the town. The three Panzer IVs were slowed over the barbed wire blocking the road, and one bogged for the remainder of the action in soggy ground. German infantry spotted a Sherman platoon camped out around one of the objectives and then ran over and around the bocage looking to avoid fire in the field beyond. Two remaining German blinds rolled to the field as US tank destroyer M10 Wolverines appeared behind the bocage at the town. The blinds revealed themselves as a Panzer III flame tank and Sd. Kfz. 124 Wespe and both turned to engage the Wolverines. Two quick shots from the flame tank failed to harm the open-topped Wolverines which returned fire and blew up the Panzer III. The German’s mobile gun fired back, destroying one of the Wolverines before subsequently being wrecked by US anti-tank fire. With German armor burning in the field, the Grenadiers continued to sprint over the open area and looked to swing into the town from the rear. On the other side of town the two functioning Panzer IVs rolled across the field, shooting at and destroying the last American tank killer. 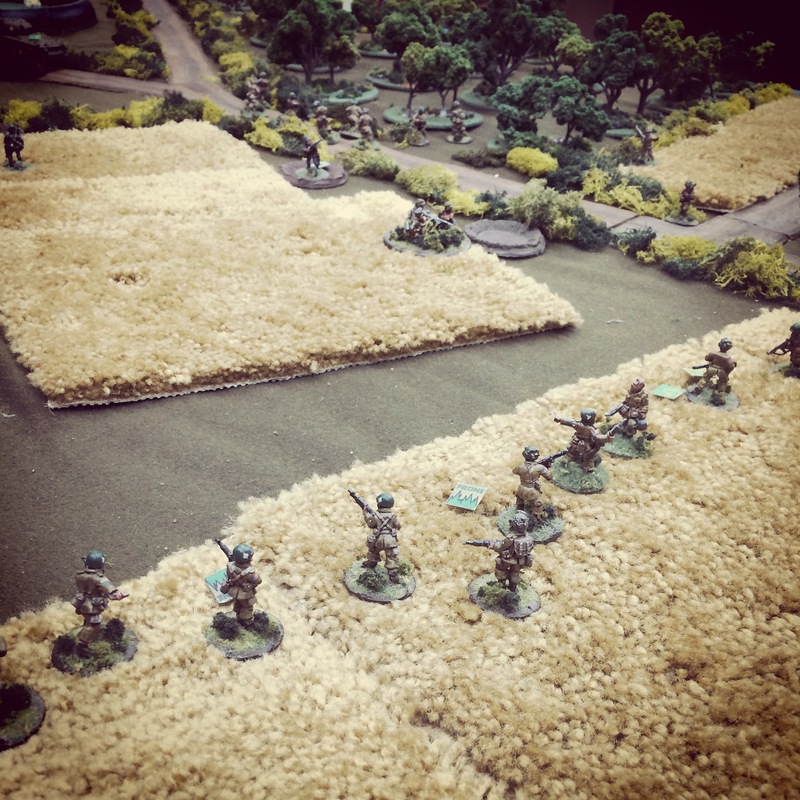 Under continued cover from their Panzers, the Grenadier platoon continued slipping across the field, climbing over the bocage and looping around to the American rear. With German infantry looking to encircle the town and two Panzers wheeling to engage the Shermans at the center of town, a German artillery barage hit dead center amid the objective buildings. As the smoke cleared, only two Shermans remained fully operational and the surviving US rifle platoons were on the run. As early morning light began to break, the Americans heard encroaching German voices from the hedgerows from every side of the town. The Panzer Lehr counterattack had been a success, and the Americans chose to cut their losses, regroup and fight again. Although the Panzer Lehr Division was held out of action during the Allied D-Day landing at Normandy in June 1944 , they would go on to provide a number of important defensive, delaying and counterattack actions in the months following. They first distinguished themselves in the days immediately after, throwing up a hasty defense at Caen against encroaching British and Canadian forces. After battles at Tilly-sur-Seulles and Villers Bocage in mid-to-late June, the vastly depleted Panzer Lehr Division was called out of the fight. With only a short time to regroup, the war-worn division was ordered west to countetattack he Allied inland progress toward Saint-Lo. 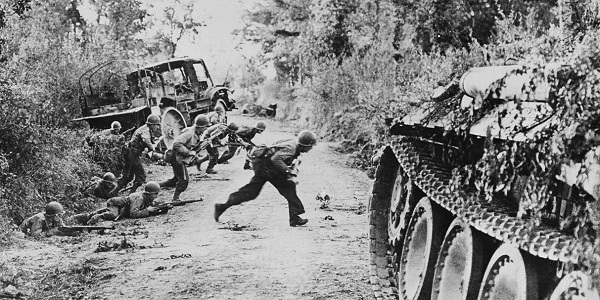 While the June battles had run the Germans up against British Commonwealth forces, the July engagements in the hilly fields and bocage-lined roads would be against the armored and infantry forces of the United States. 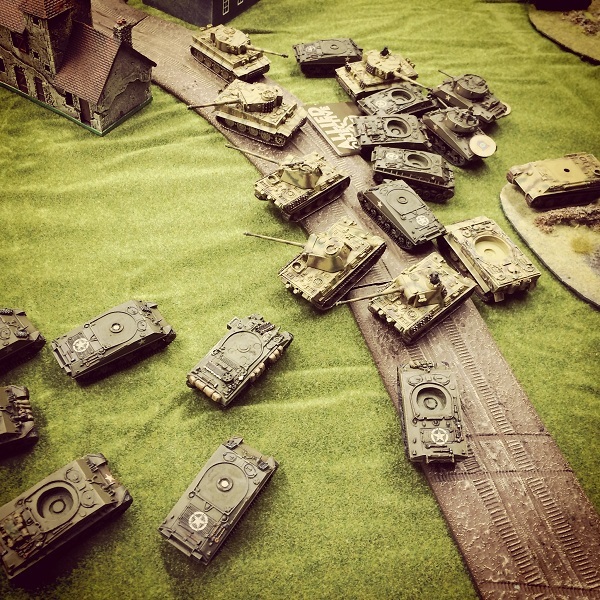 For a few months now at Metropolitan Wargamers in Brooklyn, NY, we’ve been playing a fair amount of I Ain’t Been Shot Mum rules system for World War II. After a number of one-offs and our recent North of Caen game, we finally decided to jump into a mini campaign focusing on the Allied push inland toward St Lo and the German defense following the D-Day landings in Normandy in June 1944. 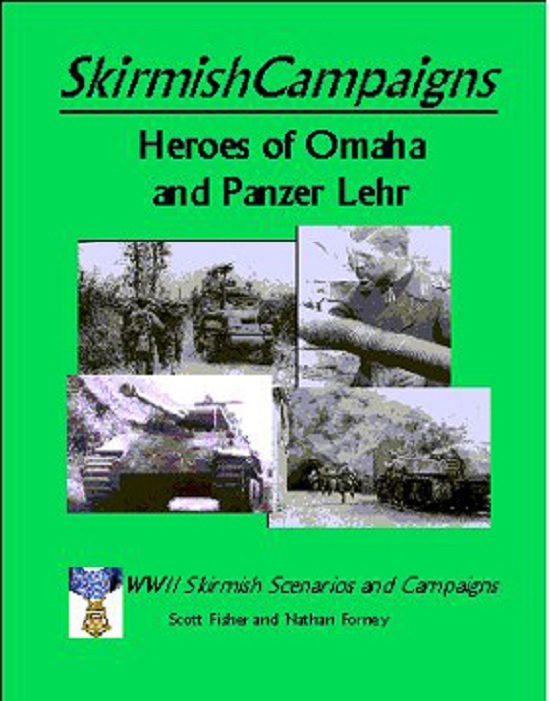 For our campaign, we’re using the classic Heroes of Omaha and Panzer Lehr scenario book from Skirmish Campaigns. The Skirmish Campaigns series of books offers well-researched and detailed campaign scenarios full of detailed orders of battle, terrain layout maps and deeply descriptive narrative of how actual engagements unfolded during World War II. 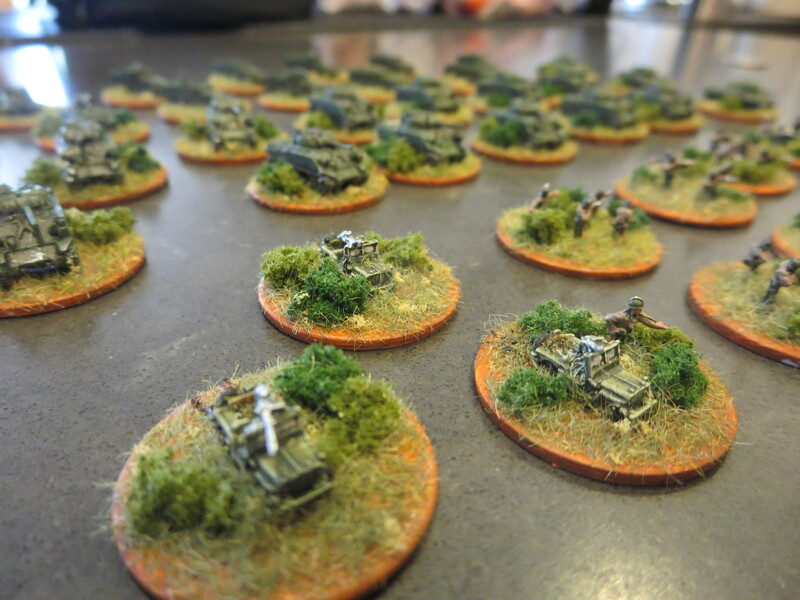 With just a little bit of work, the Skirmish Campaigns scenarios are easily adaptable to a variety of wargaming rules and scales including Battleground, Bolt Action, Flames of War and I Ain’t Been Shot Mum. The scenario at Hauts-Vents is set up on a long table with hills rolling into a valley from either end. 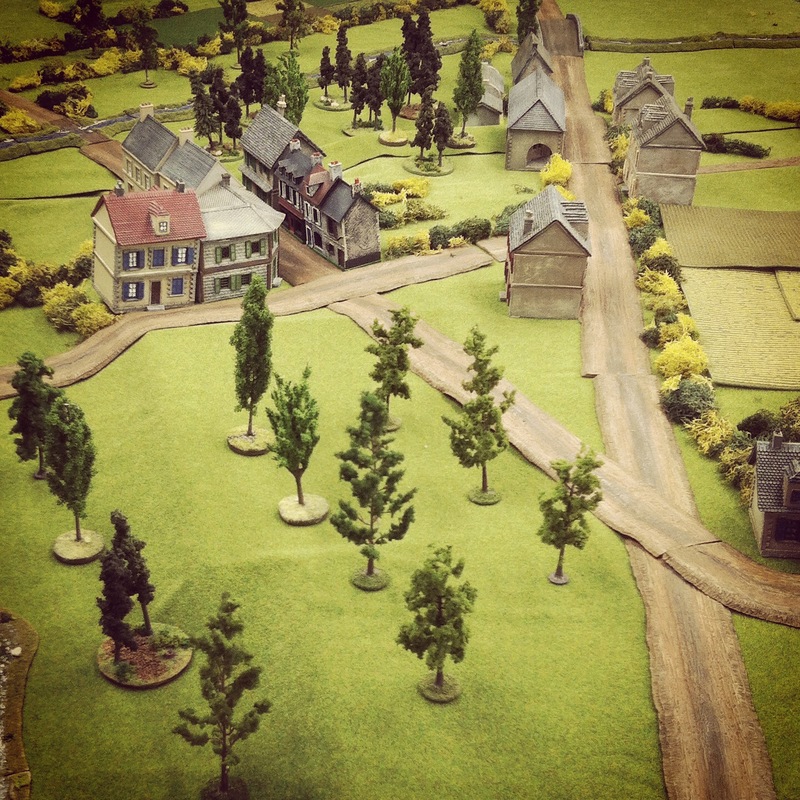 Roads cross the table among fields lined with heavy bocage hedgerows. 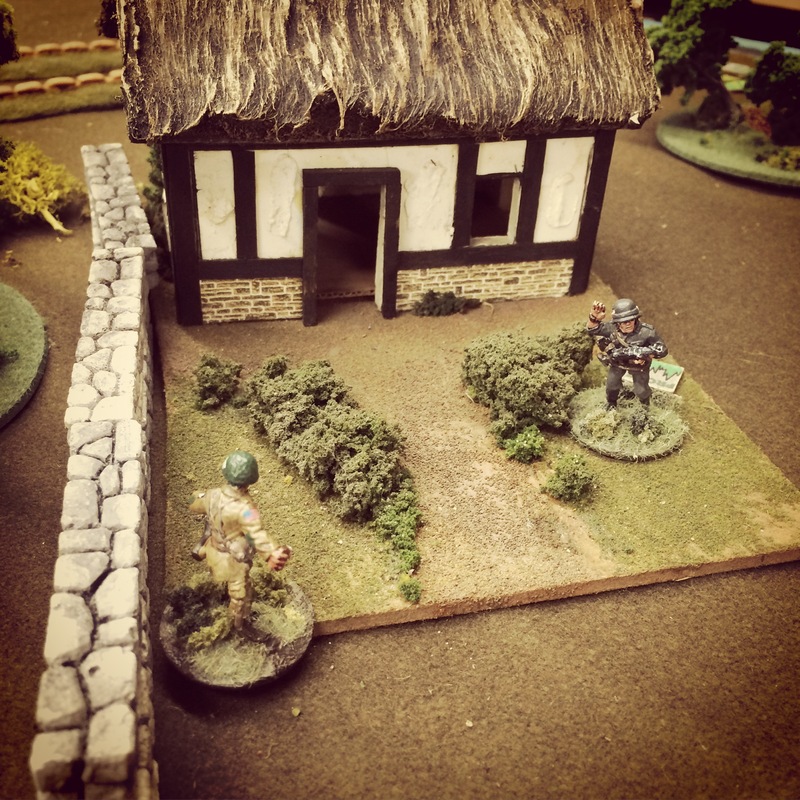 At the center of the table are two farmhouse objectives that are the focus of the US mission. All German platoons are deployed on blinds nearly everywhere on the table, accepting the northeast corner from which the US advance begins. My Germans deployed on blinds with a Pak 40, a Sdkfz 10/1 and an artillery spotter for the off-board 105mm artillery deployed around a farmhouse atop Hill 91 on the southern end of the table. 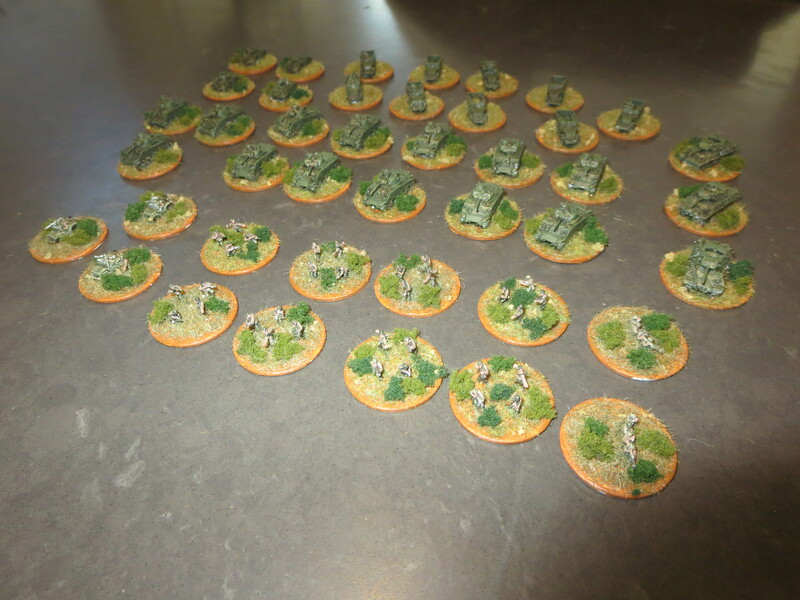 German rifle platoons armed with Panzerfausts deployed in blinds in and around the objective farmhouses. 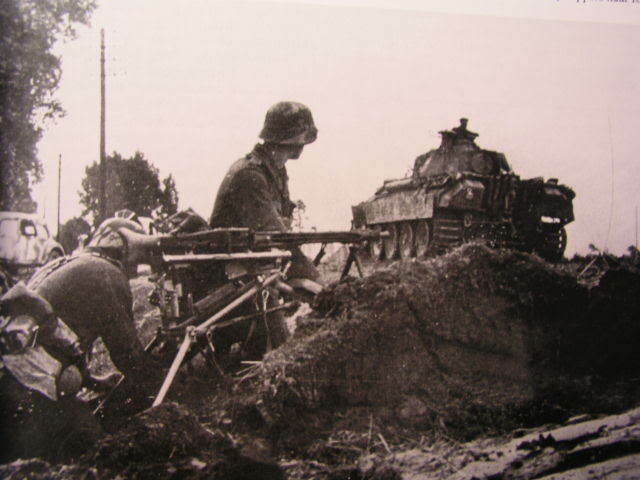 One platoon also had a MG42 and another contained a Panzerschrek anti-tank team. To block the predicted US advance, one road was blocked with barbed wire and another was laid with mines. The American blinds moved in straight in column along the road sloping down toward the valley. Heading the advance was a US recon platoon led by an M8 Greyhound armored car. 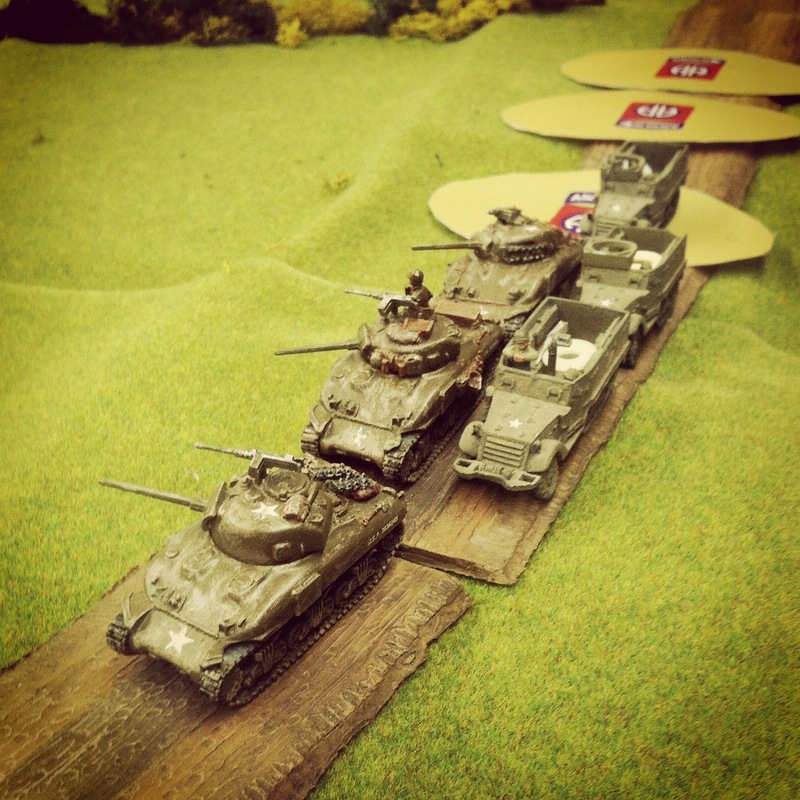 Three platoons of mechanized infantry loaded up in half tracks and a platoon of Sherman tanks fell into line behind. 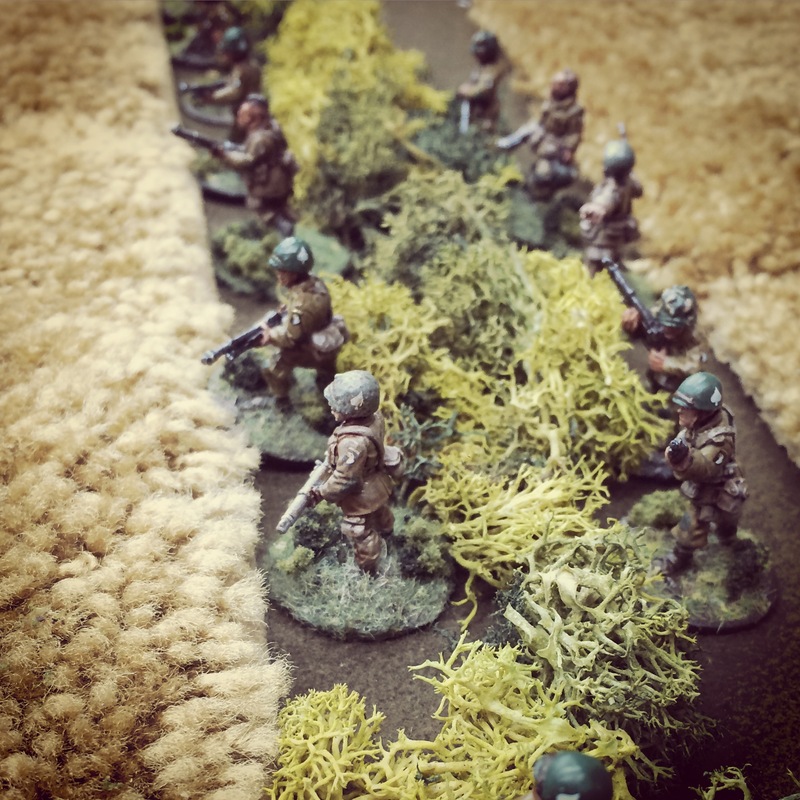 The first few turns progressed quickly with the US column moving down the road under blinds while the Germans quietly defended from concealed positions. 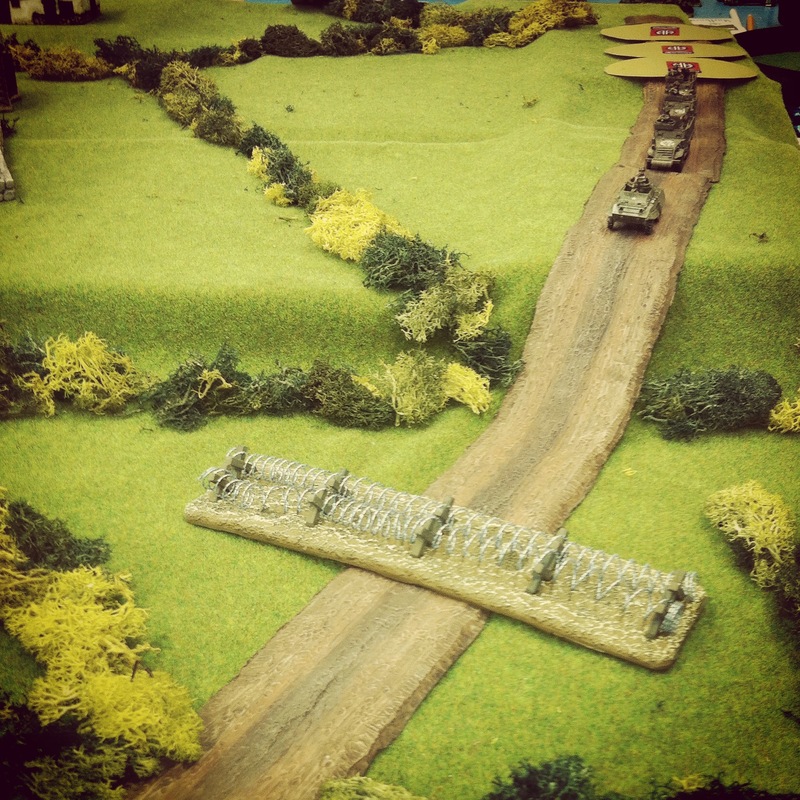 The lead Greyhound revealed the barbed wire blocking the road, forcing the first platoon of half tracks off the road toward the first objective. Closing in on the house, the German position was revealed and the Germans quickly destroyed two half tracks and their mounted infantry with shots from Panzerfausts. In subsequent turns, the US commander jumped from his vehicle and was followed in by the final half track which was also destroyed. 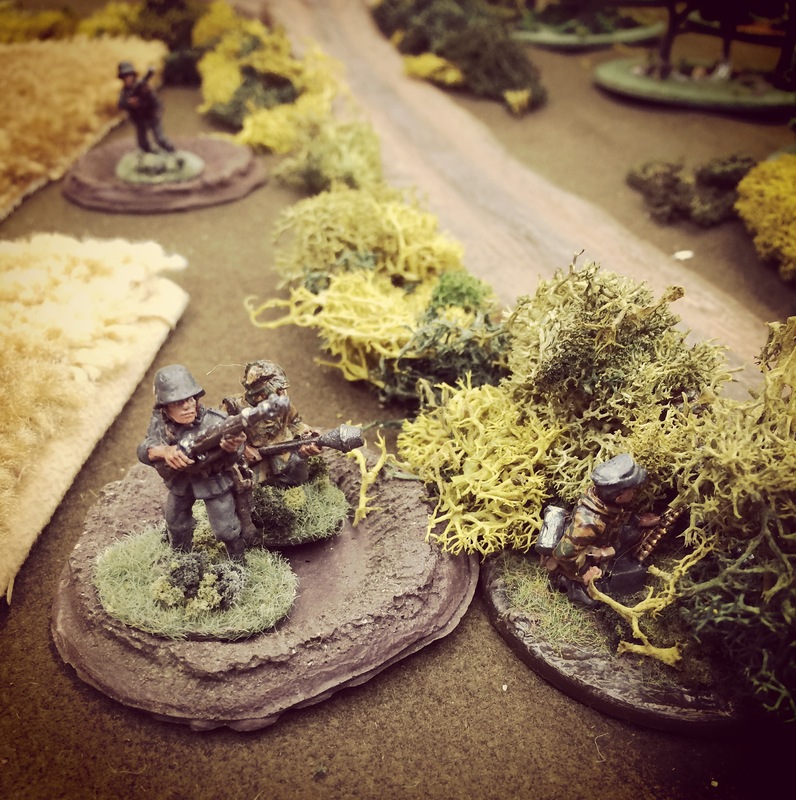 With the lone US commander in the position, the Germans assaulted taking casualties before eliminating all Americans from the disastrous head-on assault on the objective. 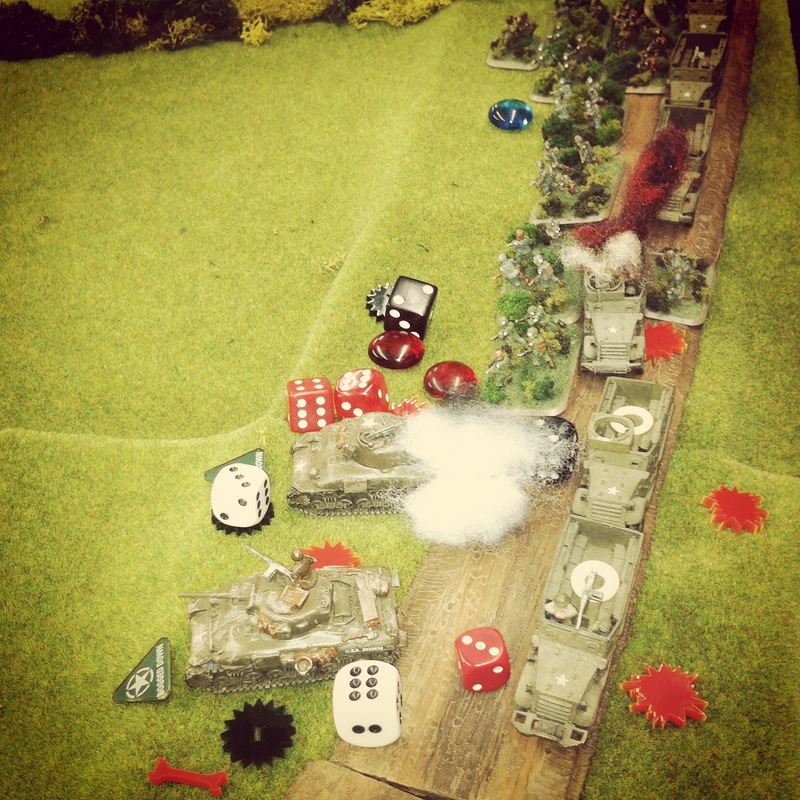 As the first platoon of US infantry fell, the remainder of the column ran into problems of their own. The Shermans attempted a push into the field off the road but two of the three quickly bogged in the rain-soaked ground. With the Shermans stalled and the rest of the column bunched-up on the road, an off-board German 105mm artillery barrage made a direct hit to the US line. 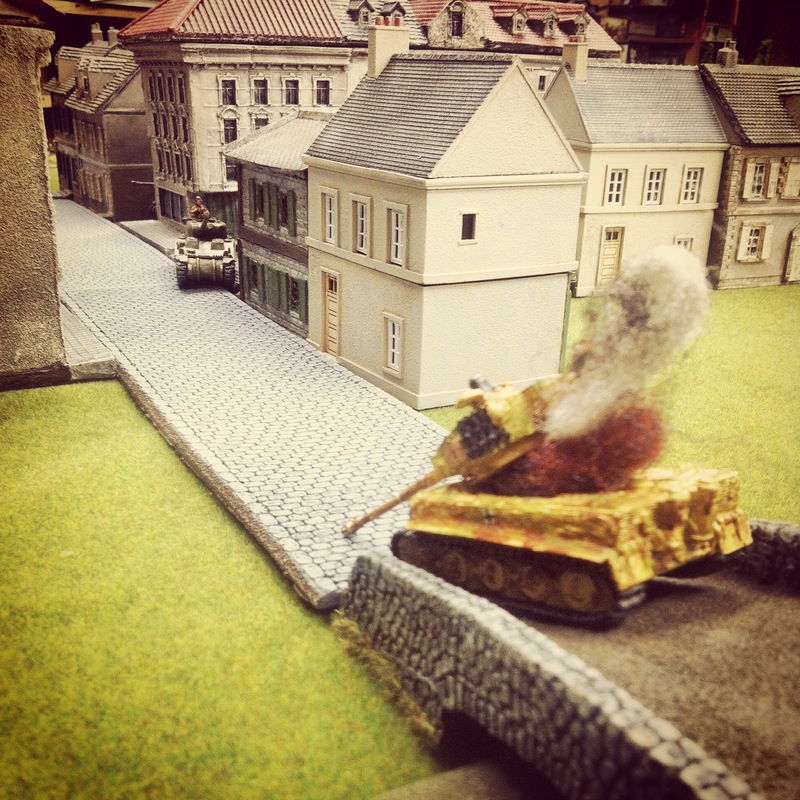 As a result, the tanks took severe damage to their sights, main guns and mobility. Infantry jumped from their half tracks and one platoon took immediate fire from German MG42s hidden in the bocage across the nearby field. As the Americans desperately attempted to spread out and move to cover, additional rounds of fire from the Pak 40 and Sdkfz 10/1 on the far hill continued to pour shots into the remnants of the burning US column. The survivors from the US column swiftly moved to position themselves for another round of assaults on the German position. 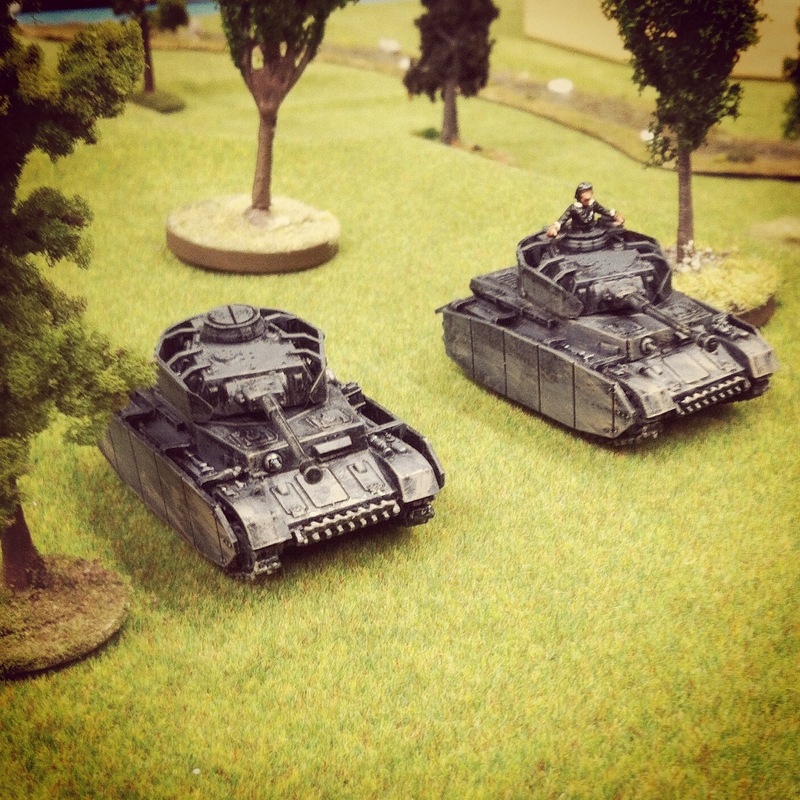 Two surviving Shermans unbogged and rolled to position along the bocage, destroying the MG42 positions along the way. 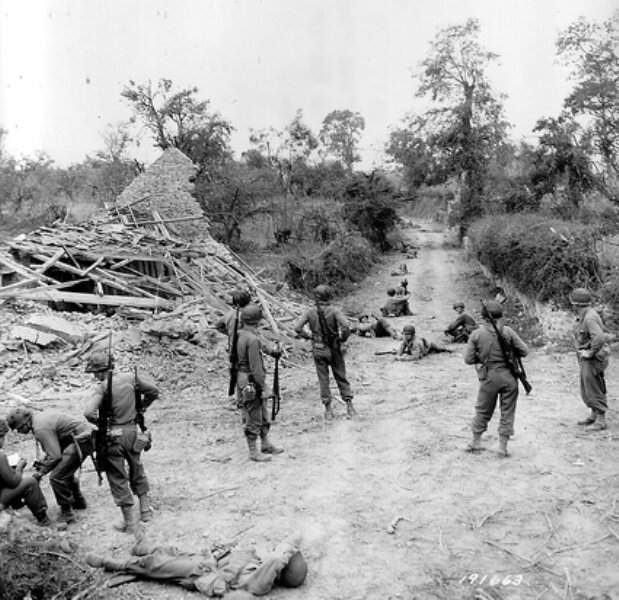 US infantry rushed in along both flanks of the German survivors at the farmhouse who were quickly reduced to a single operable fire team. US mortars followed up with a directly aimed smoke bombardment in front of the German guns on the hill, providing invaluable cover for the American ground advance. 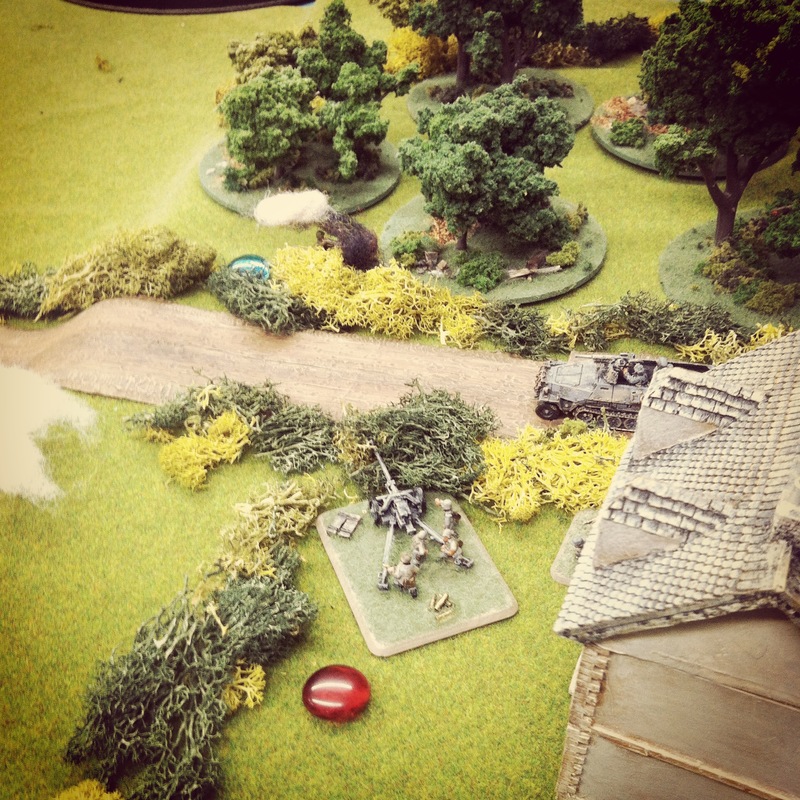 Pressure from the advancing Greyhound forced the Sdkfz 10/1 to fall back late in the game. As the armored car breached the crest of the hill, a quick shot from the Pak 40 eliminated it. Unfortunately for the Germans, this was one of their last bits of glory for the game. 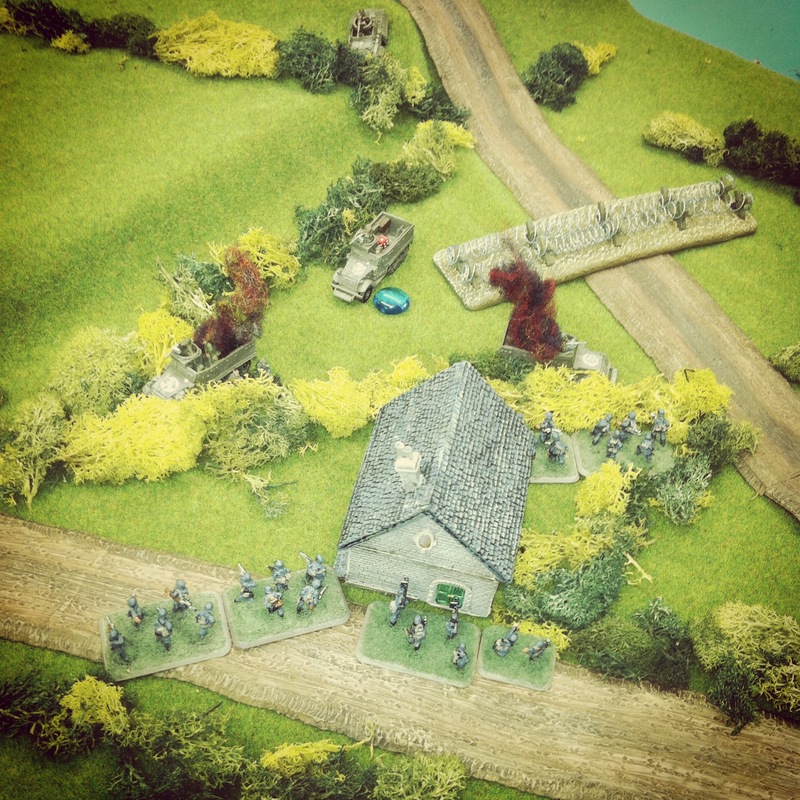 Back at the two objectives, the US moved hard toward victory. 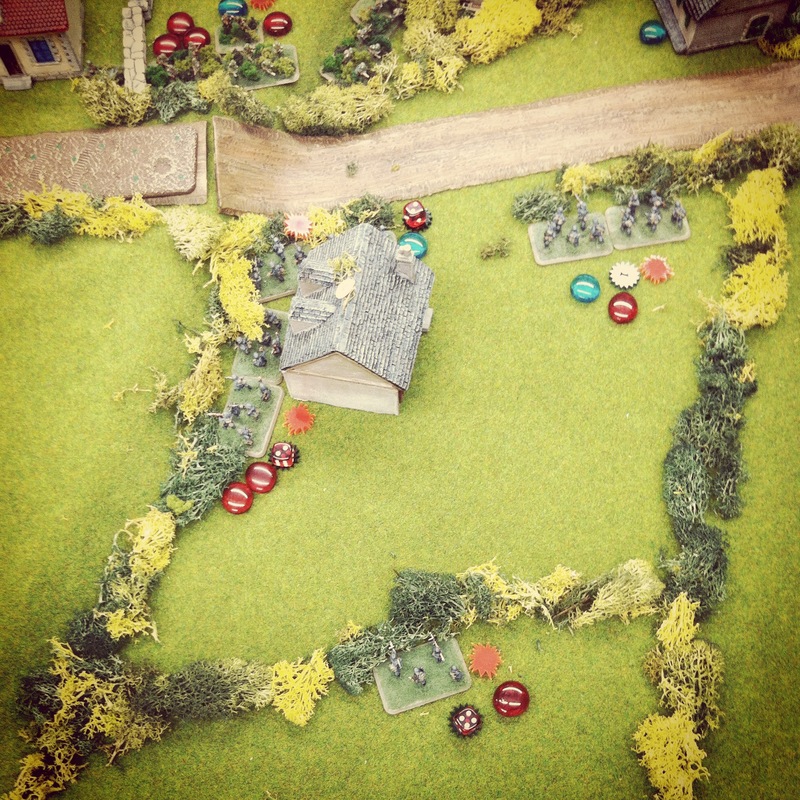 A close assault at the first house sent the survivors of two German fire teams running for the rear with heavy casualties and all but eliminated from the game. 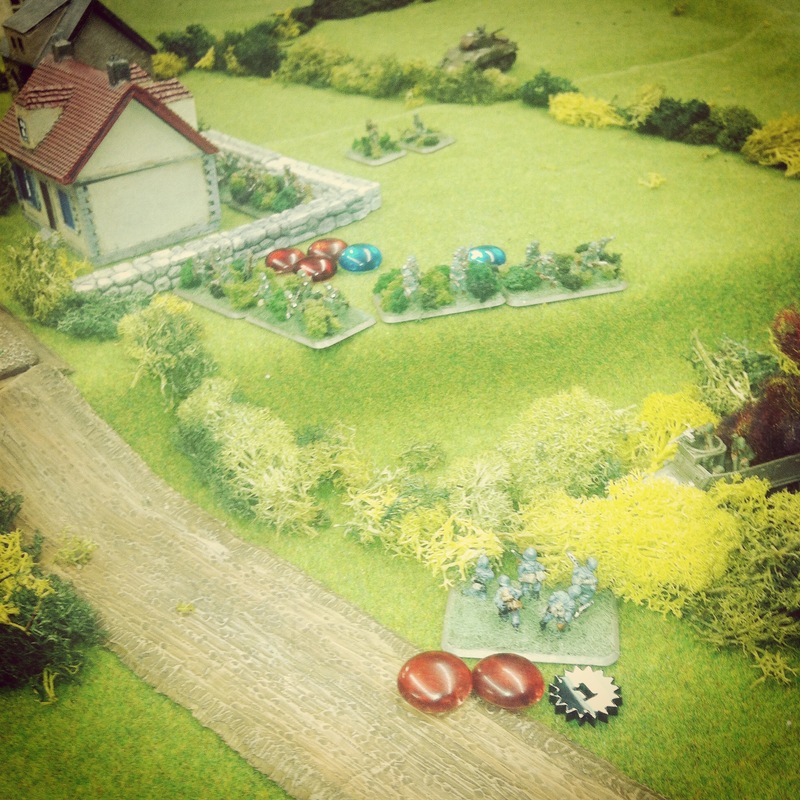 With that, one lone German platoon was exposed at the second house objective, and all US focus turned toward them. Two turns of heavy US artillery strikes and small arms fire from the bocage across the road laid waste to all but a few of the last Germans holding out. With the US Shermans still working their way on the German left and US infantry closing on the front, my Germans threw up their hands in defeat. The first day of battle at Hauts-Vents went to the Americans, but as dark was drawing near, another battle was already looming before dawn as more Germans rushed to the defense. Just over two months after the Allied D-Day landings, the Normandy campaign marched toward a conclusion at the Battle of the Falaise Pocket in mid-August 1944. With orders not to withdraw, a last ditch German defense was cobbled together from surviving Panzer divisions in an area about 20 miles south of Caen. Over a nine day period desperate fighting, the German defenders were eventually encircled by overwhelming British, Canadian and US forces. Aside from tens-of-thousands of surrendering troops, Germany had suffered enormous losses in its dwindling tank forces. Elements of the German 7th Army managed to elude capture and slipped back to the German border, although they too took heavy losses in men and and equipment. On August 18, 1944, Canadians from the Argyll & Sutherland Highlanders and armored South Alberta Regiment made way for Saint Lambert-Sur-Dives. The objective was to take and hold the town, thus preventing more Germans from slipping out of the Allied encirclement. Over three days of infantry fighting and tank duels in and around the town, heavy losses piled up on both sides. 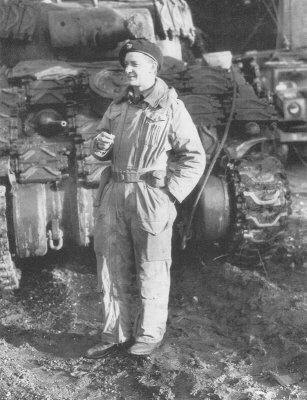 With dozens of vehicles and tanks destroyed, the surviving Germans surrendered to Major David Currie. Currie’s actions at Saint Lambert-Sur-Dives earned him the Victoria Cross, the only one earned by a Canadian during the Normandy campaign. 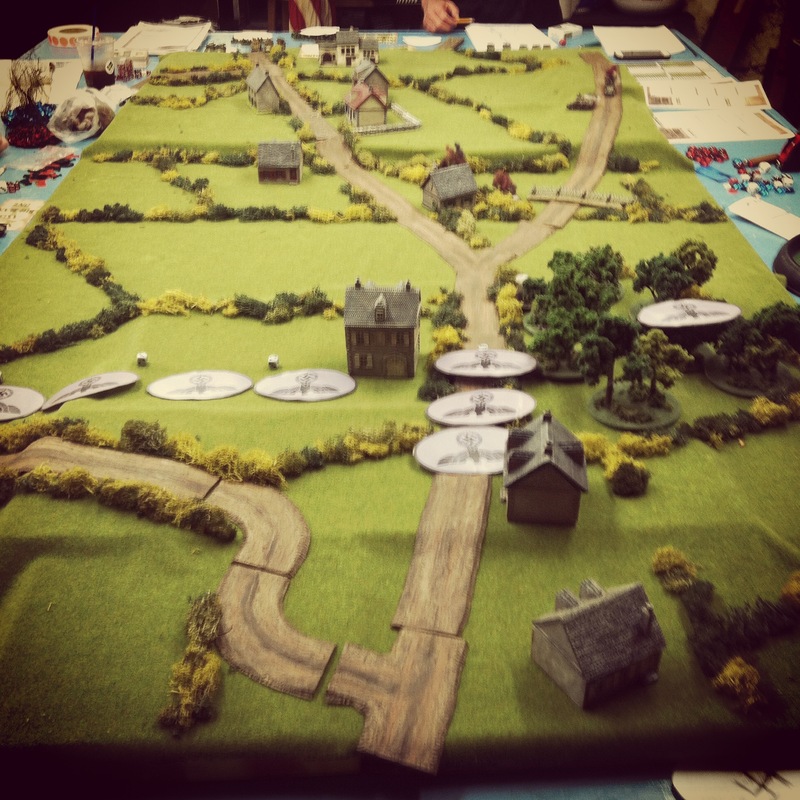 The rulebook for I Ain’t Been Shot Mum from Too Fat Lardies includes a scenario for the battle at Saint Lambert-Sur-Dives which we recently ran at Metropolitan Wargamers in Brooklyn, NY. 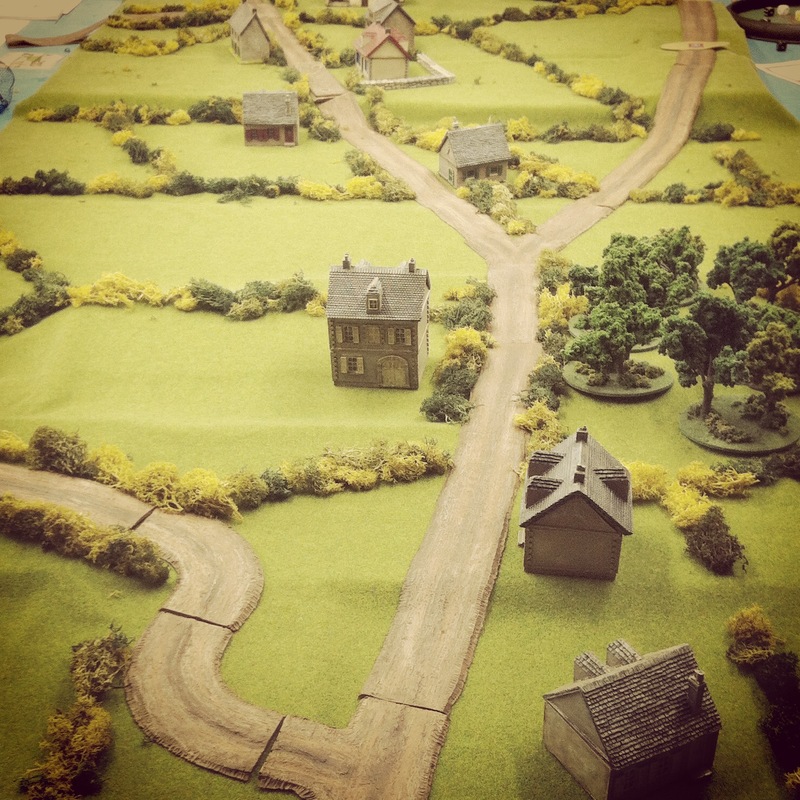 Using 15mm terrain, we set up the table with a series of roads intersecting at the town sitting at the edge of a hill surrounded by fields, orchards and hedgerows. My first Canadian platoons arrived under blinds along the road to the north heading straight for the town where the Germans waited. 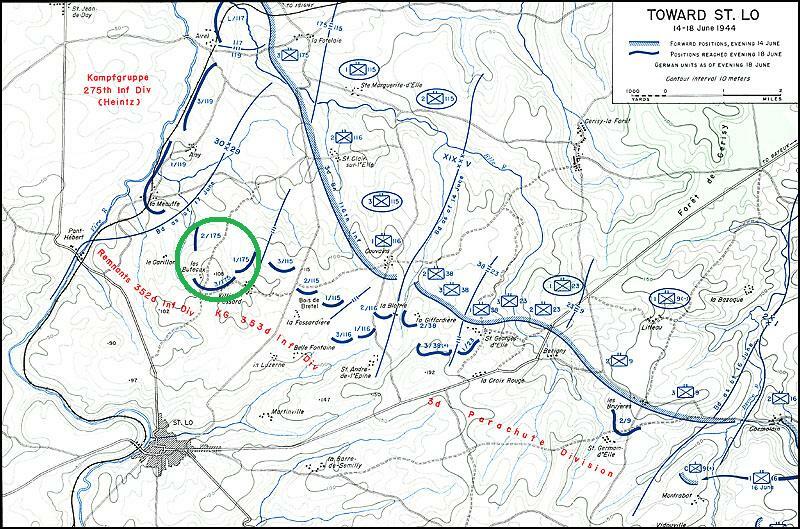 With several turns of movement under blinds, the plan for each side was quickly exposed in two main areas of the field. 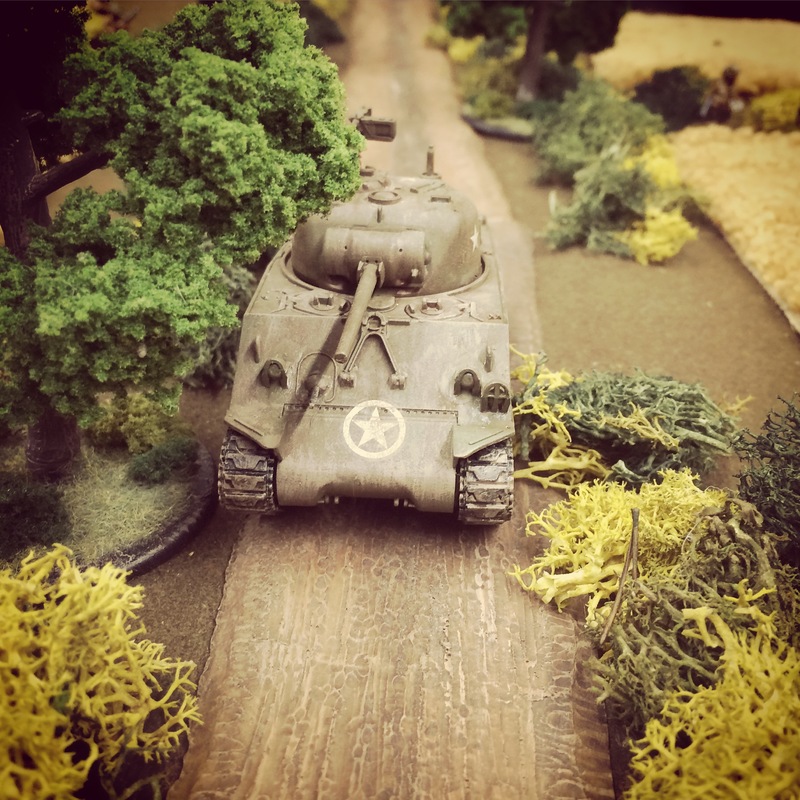 My two platoons of M4 Sherman and Firefly tanks made straight down the main road toward the crossroads objective. 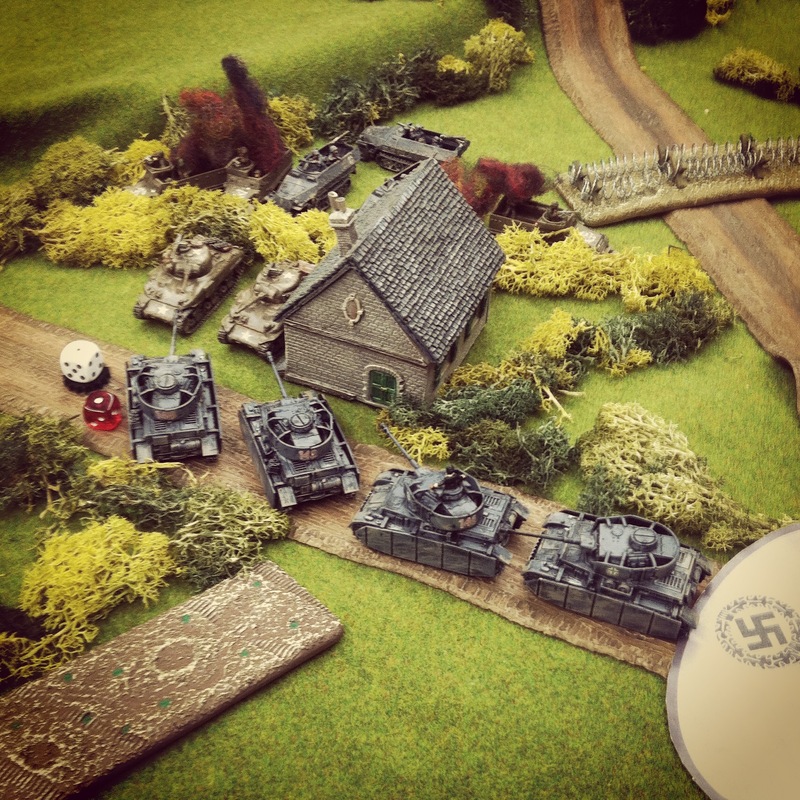 To stave off the Canadian armor, the Germans quickly set up their Panther A and Tiger tanks behind a hedge southeast of town. The other German armor, two Panzer IVs operating without a commander present, set up in the orchard south of town and covering the other main road to the objective. 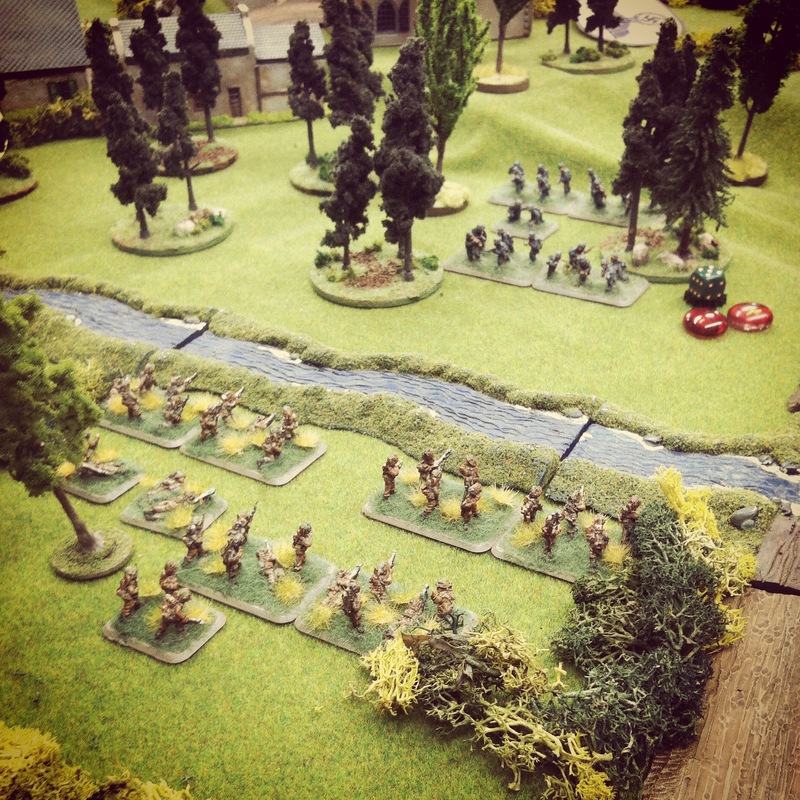 Two platoons of Canadian rifle infantry crossed the river. One made way to the orchard just north of town at the middle. Meeting them was a single, smaller German rifle platoon. 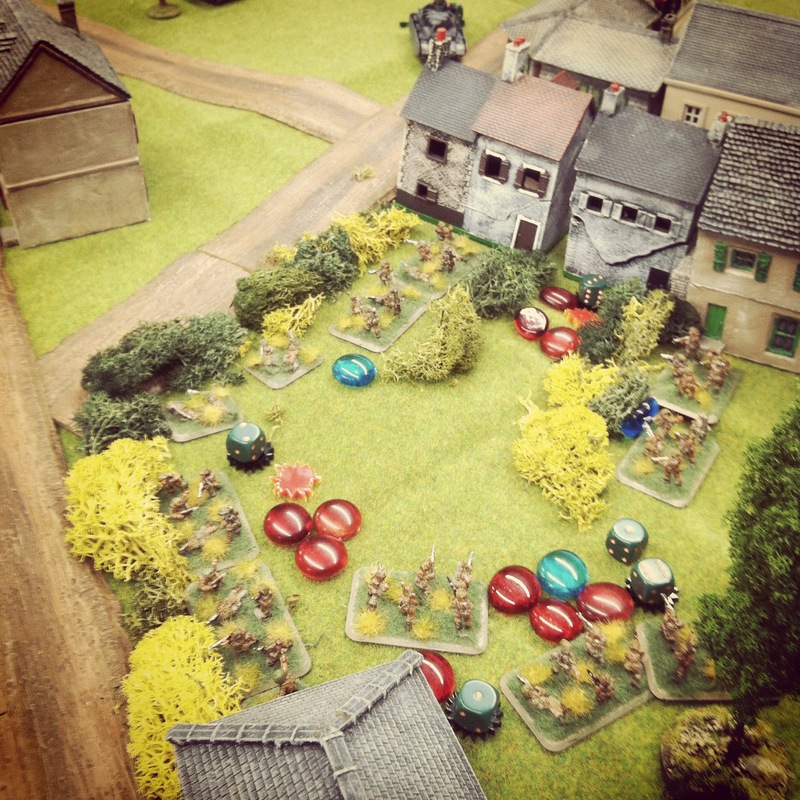 The veteran Canadians quickly destroyed half of one fire team from the tired, German regulars. The surviving Germans pulled back to take up position in the buildings in town as the Canadians pursued. The second Canadian rifle platoon made way through the buildings nearby their fellow Canadian tank platoons. 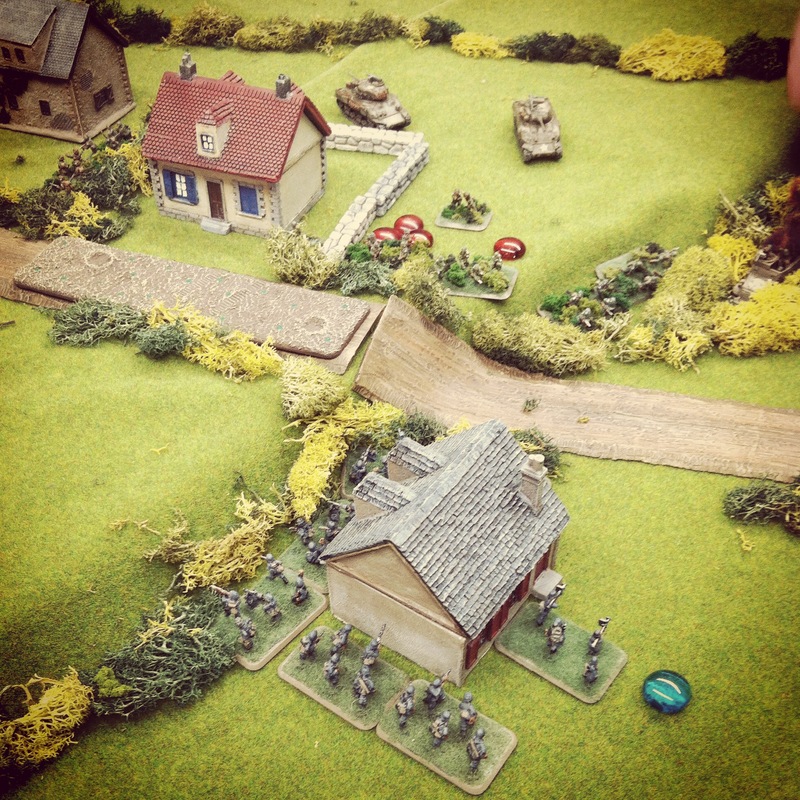 Once close enough, the Canadian rifles exposed a German platoon armed with a frightful MG42 camped out in a farmhouse on the eastern edge of town. Thus all the infantry settled into a series of firing positions at the center of town with the Canadians taking fire from German rifles and machine guns on two sides. 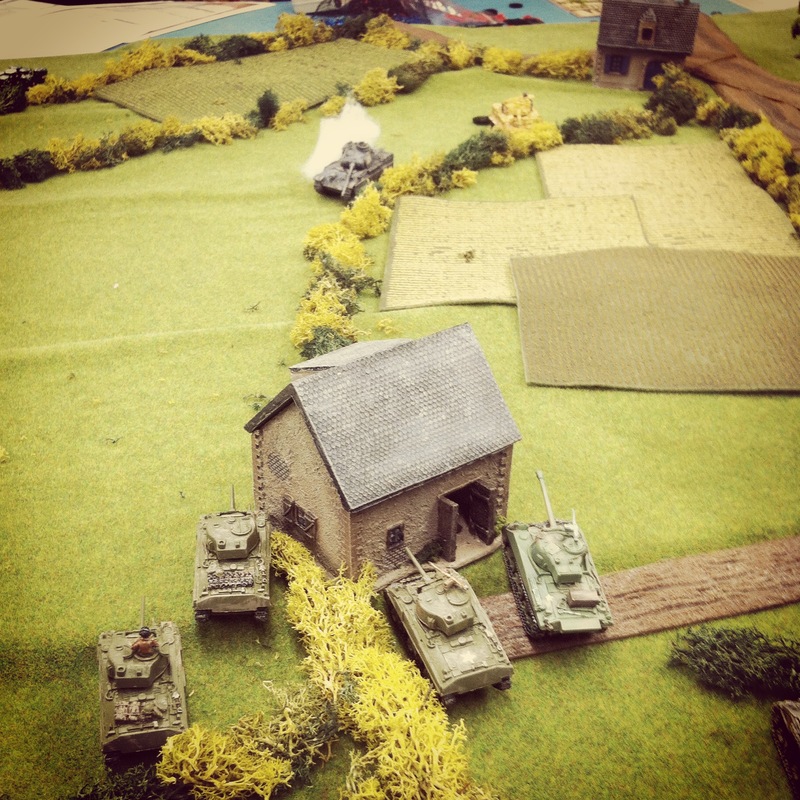 At the farm to the east, a game-long tank duel erupted with the Canadian Shermans and Firefly tanks firing from positions behind the French farm’s buildings. 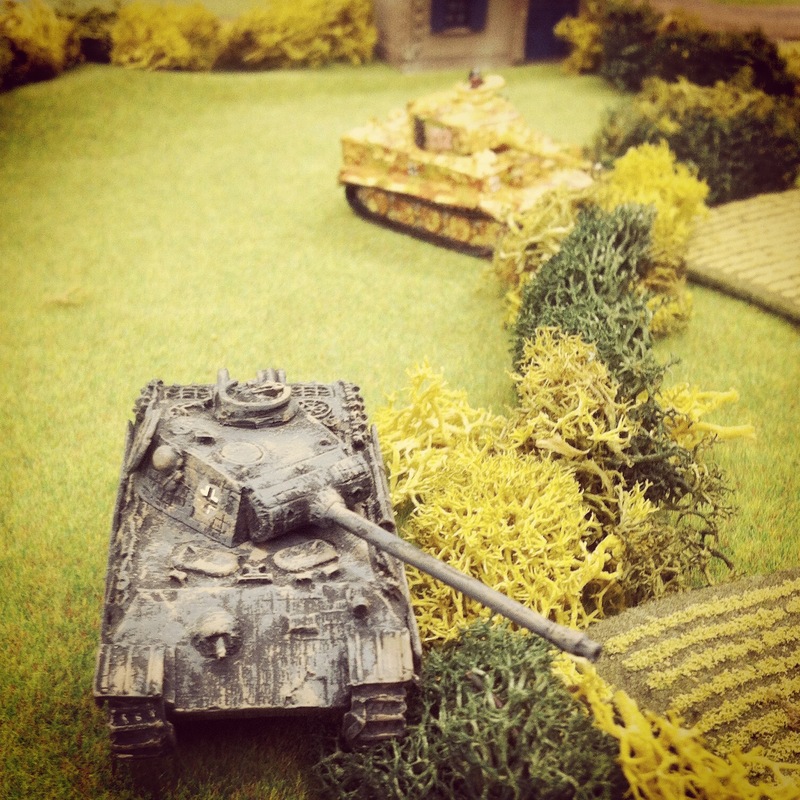 The German Panther and Tiger fired from light cover of a hedgerow over the fields beyond. In two turns of fire, the Panther sat in flames and the Sherman platoons were able to focus on the Tiger which unsuccessfully returned fire over repeated tries. One Panzer IV shot harrassingly at the Sherman platoon closer to town which was forced to turn its guns away from the Tiger to return fire. Back at the town’s center, the Canadian infantry took heavy casualties from German rifles shooting from building windows and the Panzer IVs firing from the orchard. 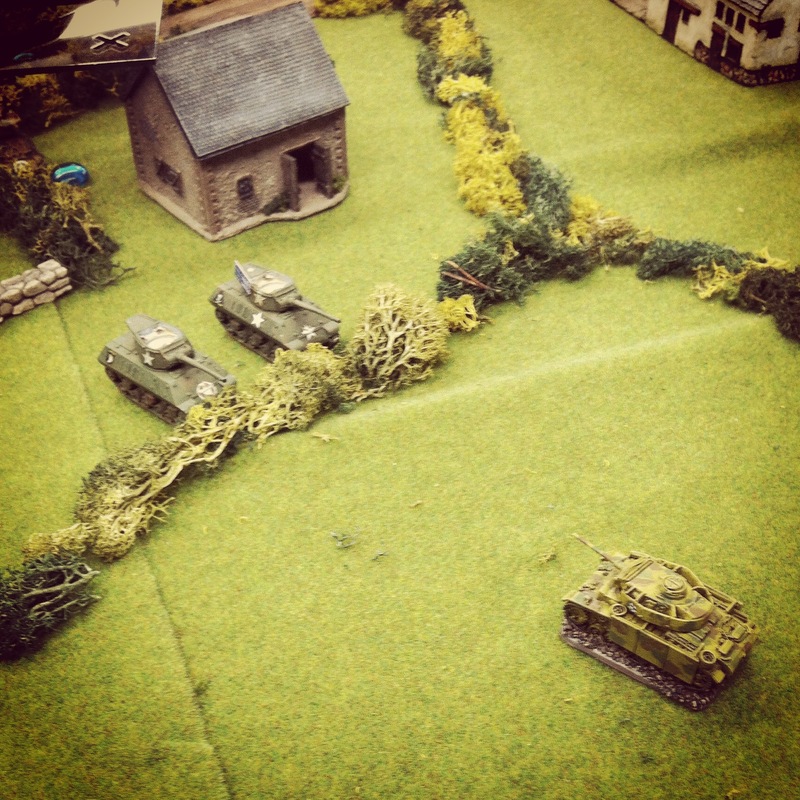 The breakthrough for the Canadians came as the Tiger was destroyed and the Shermans were able to fire up their engines and make way across the fields. 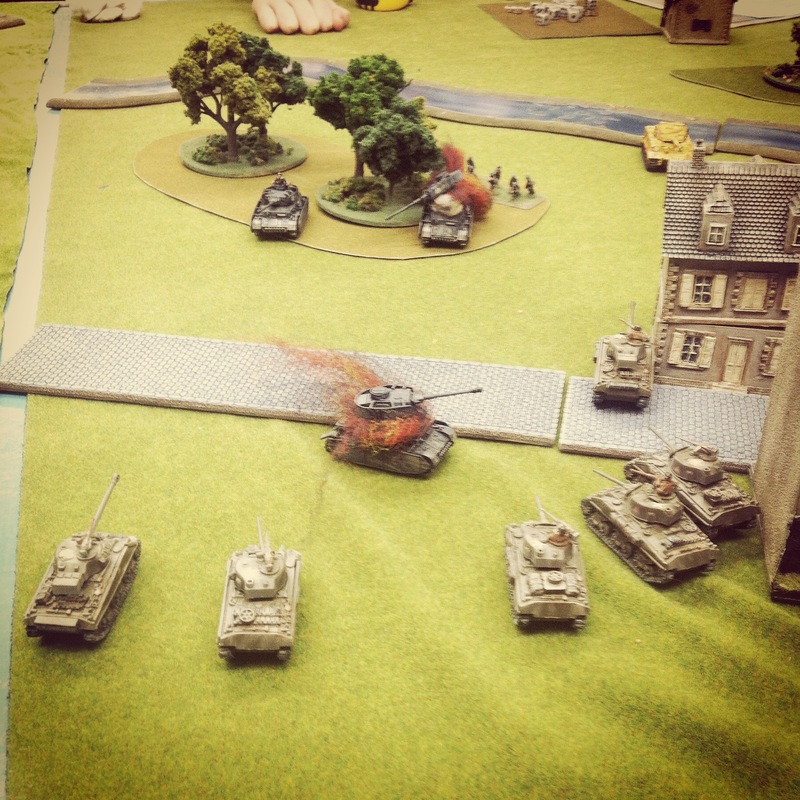 Turning the Sherman and Firefly guns to the orchard, the Panzer IVs were quickly destroyed. 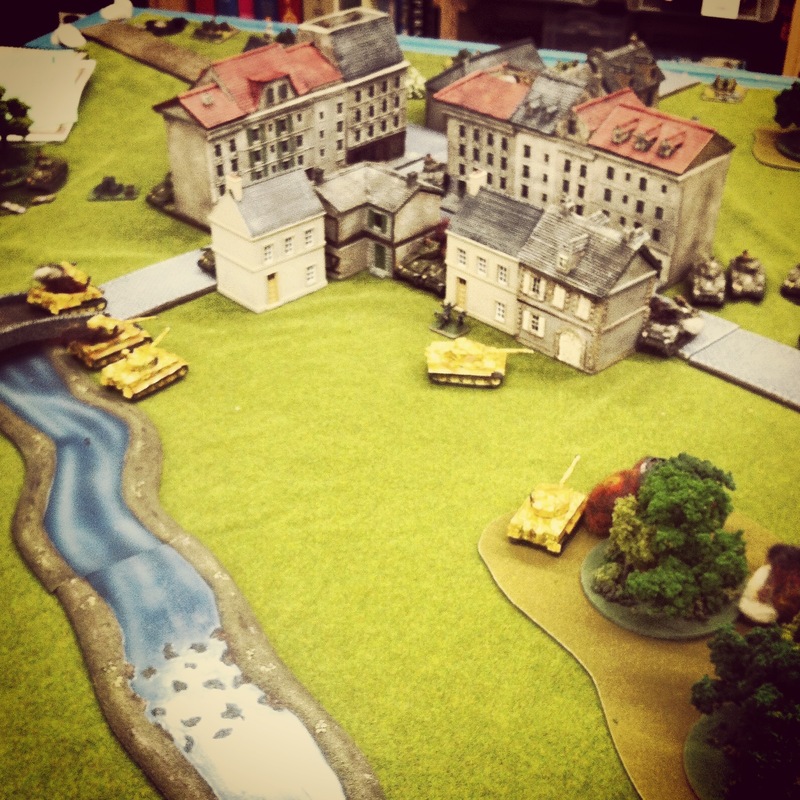 One more fresh German rifle platoon finally moved to occupy buildings in the town, but by then the path was wide open for the Canadian armor to roll unmolested to the crossroads objective and victory. This was our first IABSM game using a lot of armor, and the unbalanced number of Canadian tanks firing and moving without a single loss clinched the game for the Allies. The veteran Canadian rifles had also served their purpose of locking down the town in a pitched battle with their numbers and quality allowing them to hold out against their German foes. Seventy years ago at Saint Lambert-Sur-Dives the German surrender was captured by a a film crew, and bits of the film survive today (see below). 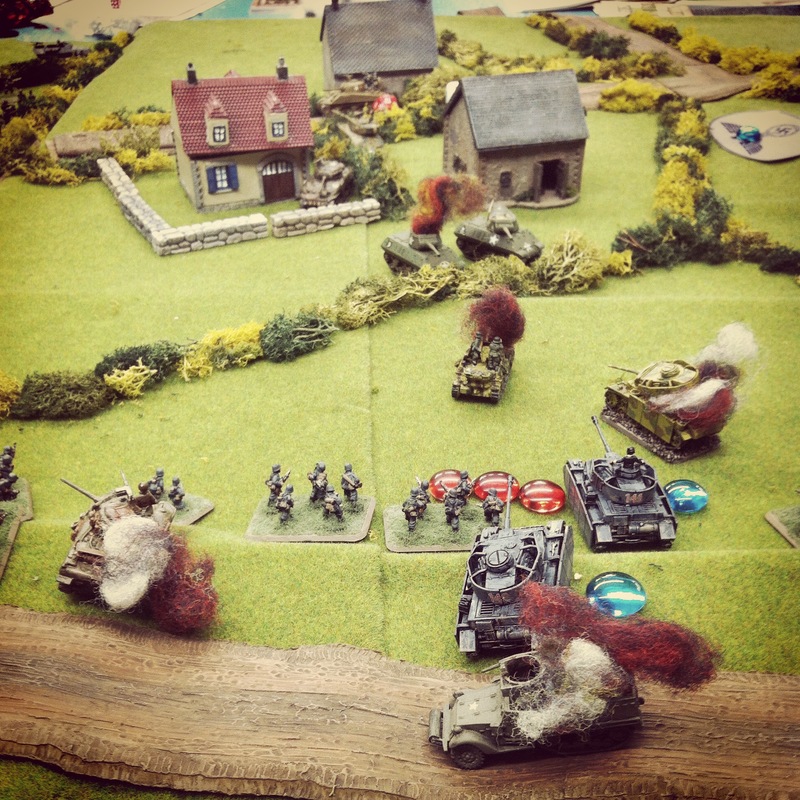 The exploits of the Canadians in the Falaise Pocket led by Major David Currie helped seal victory for the Allies after months of fighting in Normandy, and his miniature tank crews won the battle again on our tabletop historical repeat of this important victory at one more crossroads in the French countryside. I’m working my way through my new 6mm micro armor modelling project using models from GHQ. After painting I arrived at the stage of applying decals which I also ordered from GHQ. Like many hobbyists, I have a love-hate relationship with decals at any scale. Cutting and applying decals can be frustrating as they fold, tear or wind up in the wrong positions on models. On the other hand, getting decals successfully applied to models adds a ton of personality to a paint job and can allow for easier identification during play on the tabletop. An experienced micro armor modeller and player at Metropolitan Wargamers in Brooklyn, NY turned me on to his technique for applying decals to 6mm models which I’ve found to be fast and easy with great results. Being organized and methodical in an assembly line manner is key. Having the right equipment is also a necessity. Magnifying reading glasses keeps all the tiny decals and models in focus. Working off a clean, flat hobby mat provides an ideal surface to cut decals and also keeps things easy to see. A sharp hobby knife with a fresh blade, some very fine brushes, clean water, white glue, paper towels and a cotton swab round out the basic equipment. Finally, using a decal fixative (I use Walthers Solvaset) gives a good bond for decals once applied, nestling them into the uneven surfaces of the model. Carefully cut around the shape of each decal with a very sharp hobby knife. Using a finger tip, dot several small beads of clean water in a row on the work surface. 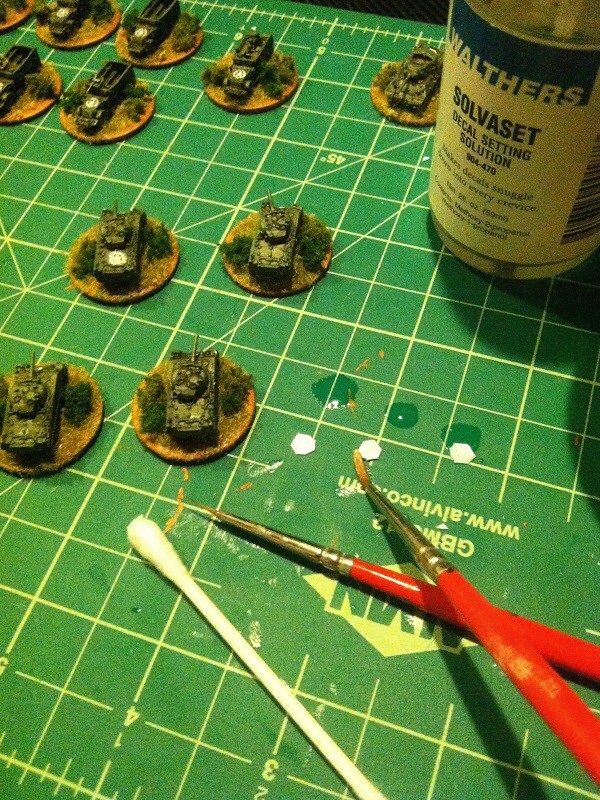 Apply a small amount of watered-down white glue to the surface of the model where the decal will be applied. Carefully push a decal into a bead of water using a small brush. After a few seconds, roll the decal off its paper backing using a fine brush. Roll the decal onto the model’s surface and gently push it into position. After a few minutes of drying time, dab the decal area with a cotton swab to remove any excess water. Coat the decal and the immediate area with a decal fixative solvent. Once models are completely dry, spray with a protective matte finish. Historic markings varied a lot during World War II, so I largely came up with my own simple plan for my decals. Each one of my half tracks got encircled white air-observation stars on the hood. My Shermans each received two stars, one plain star on the front hull and an encircled white star on the rear deck of the tank. The M10 Wolverines and armored cars likewise received white stars in circles on the rear deck area. I was able to complete all my decals in just two evenings, totaling just about two hours. I couldn’t be more pleased with the results, and I didn’t lose a single decal in the process. Now that I’ve got my newly-learned technique down, it’s on to my German armor and then the battlefield. 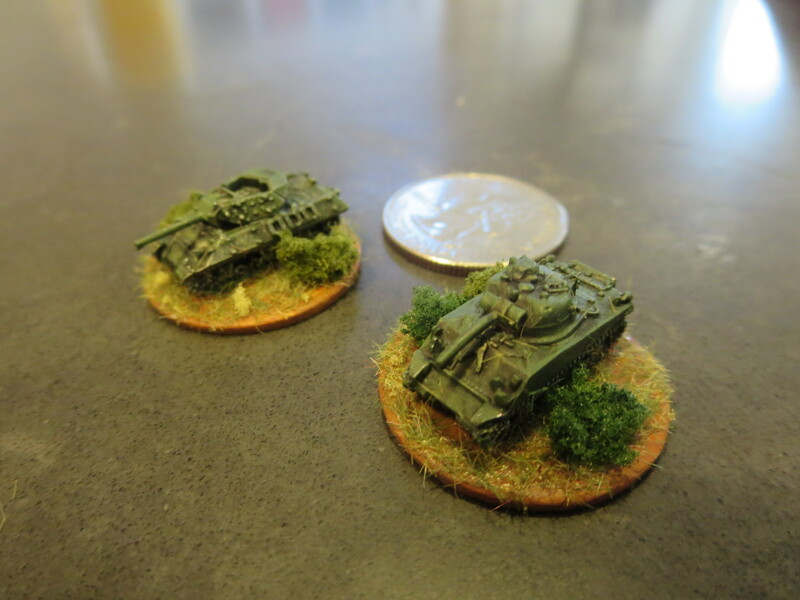 A few months back I jumped into World War II 6mm micro armour with a few initial purchases from GHQ and a general post on getting started with the scale. 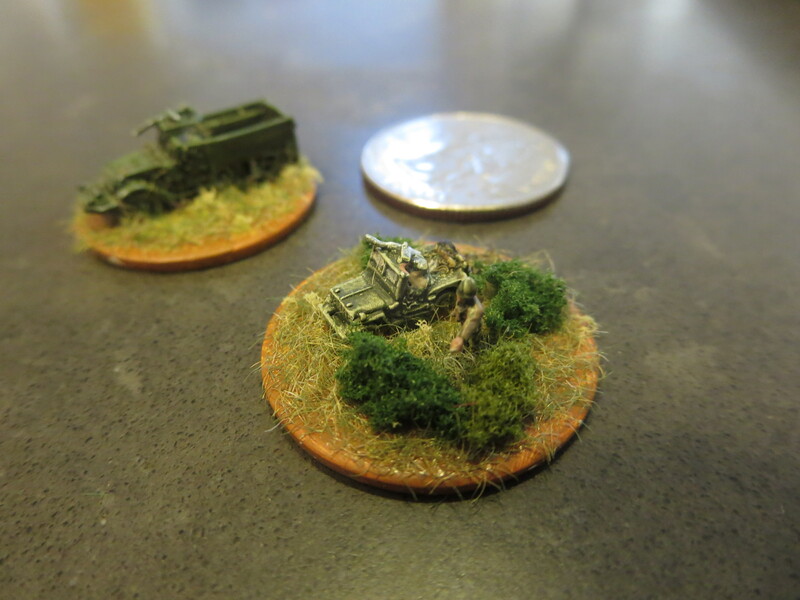 With some other 15mm Flames of War projects taking precedent, my 6mm project has been sitting on the back burner until this past week. 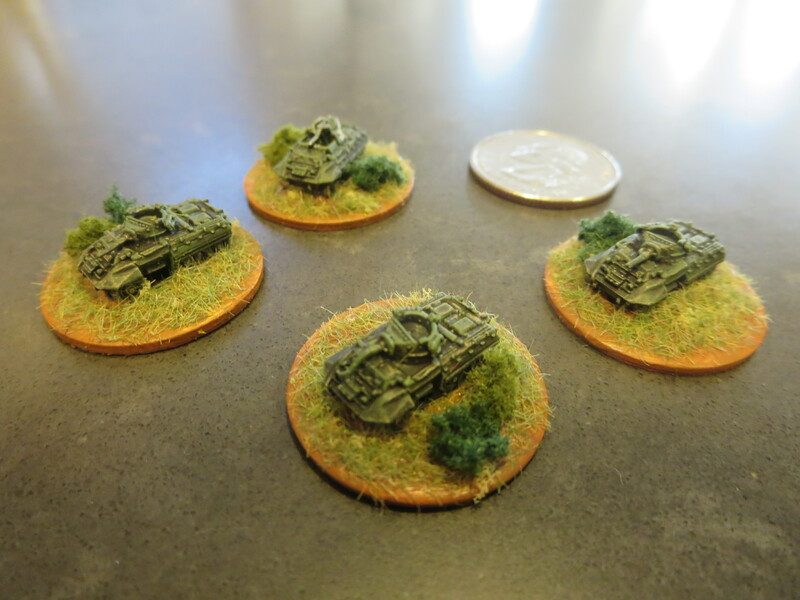 I started my US forces with models from the US Armored Infantry Command 1944 and Shermans vs. Panzer IVs Battle Box sets from GHQ. The infantry set gives me a bunch of infantry, bazookas, an M20 armored car, three M8 armored cars, eight half tracks, three M10 Wolverines, three 75mm Shermans and three jeeps. From the US/German box I get another ten Sherman tanks. All together, I’ve got a pretty sizable and inexpensive US force typical of the late war in Europe. This was my first time painting 6mm models, so I worked out a quick technique for painting infantry, transports and armor that gave pretty great results. I picked up a pair of 1.5x strength reading glasses which really helped in bringing the models into focus as I dabbed paint to the models using an ultra fine brush. By gluing the models to metal washers I was able to affix the models to a strip of magnetic basing, allowing me to rotate the models easily to paint from every angle. Glue a small piece of card over the center hole of washers. Glue models to washer bases. Basecoat models and bases with white spray primer. Wash models in a mix of 1 part dark green, 1 part light green and 5 parts water. Paint hands and faces flesh. Paint gun barrels and equipment details gun-metal silver. Lightly coat models in mud brown wash.
Dry brush light green highlights to models. Dry brush tracks, machine guns and body details gun-metal silver. Paint tire tracks on bases dark brown. 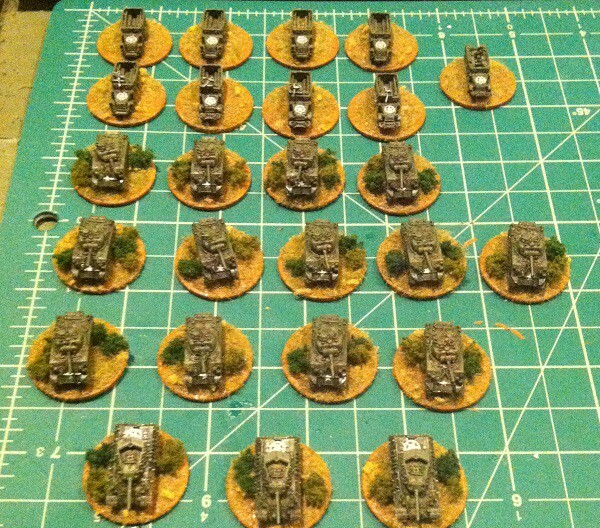 All that’s left now for my US force is to apply some tiny decals on my tanks, armored vehicles and transports. Up next, I’ve got my eye on some additional German armoured infantry to go along with the Panzer IVs I already have on hand. Once I have my Germans on the workbench I’ll get some pics and process notes on painting up my first Axis troops at this scale. 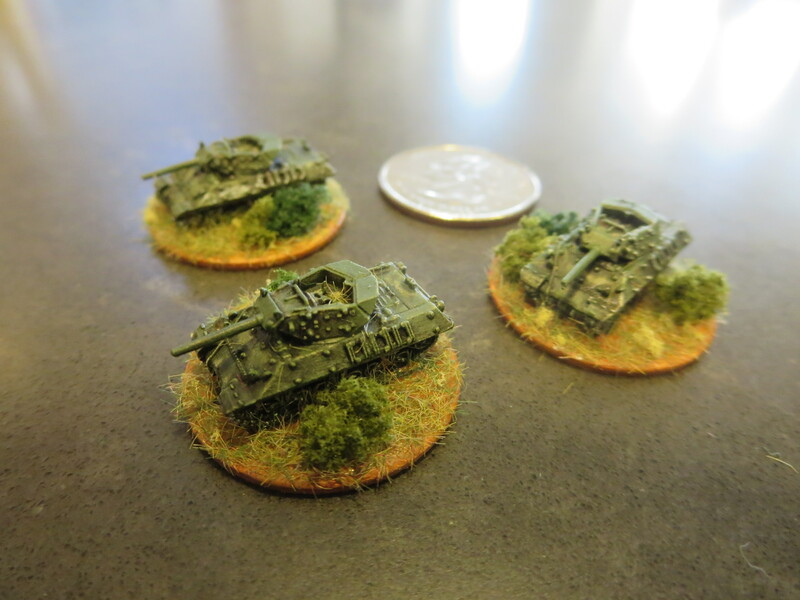 Until then, have a look a more photos below of where I am so far on my wargaming project in 6mm.